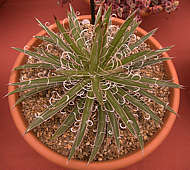 In the American continent, the succulent monocotyledons have diverged into a number of important families of succulent plants, including the Agavaceae which form distinctive rosettes and flower spikes. 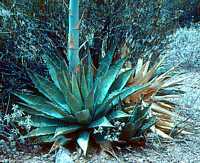 The Agavaceae family includes Agave, Beschorneria, Furcraea, Hesperaloe, Hesperocallis, Manfreda, Polianthes, Prochnyanthes, and Yucca. 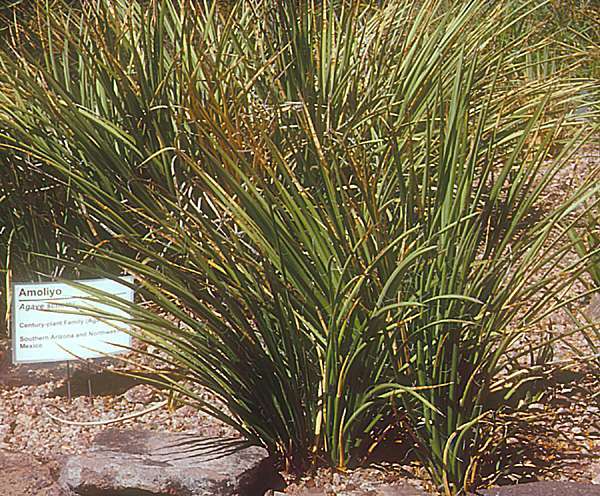 The genera Beaucarnea, Calibanus, Dasylirion and Nolina were formerly included in the Agavaceae but are now generally regarded as members of the Nolinaceae. 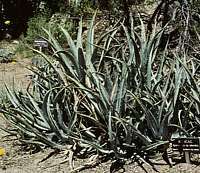 The Old World Dracenaceae were also once grouped with the Agave family but are now in a family of their own. 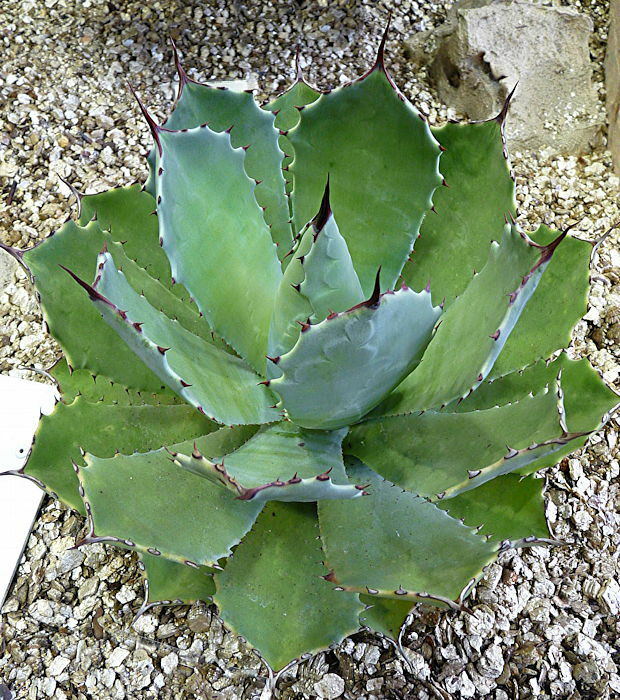 This page focuses on the genus Agave. 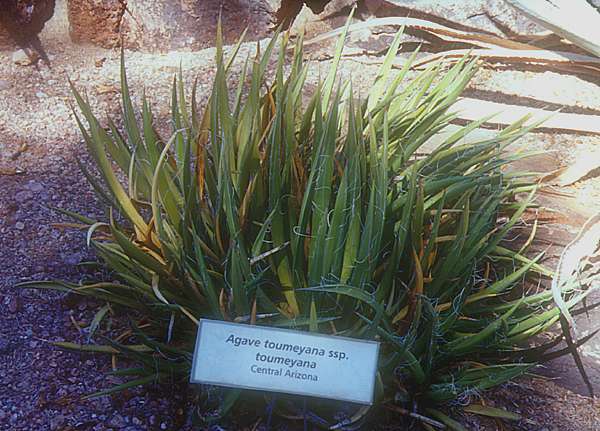 Agavaceae other than the genus Agave are grouped separately. Click on the pictures below for a higher quality image. 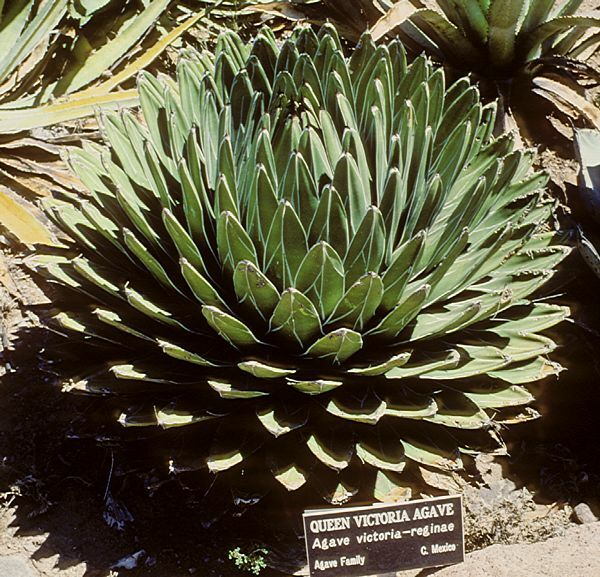 Over 300 species of Agave have been described, but only about 200 are currently recognised. Most species are monocarpic, although a few can flower several times during their life. The flowers are "perfect" with both male and female parts. 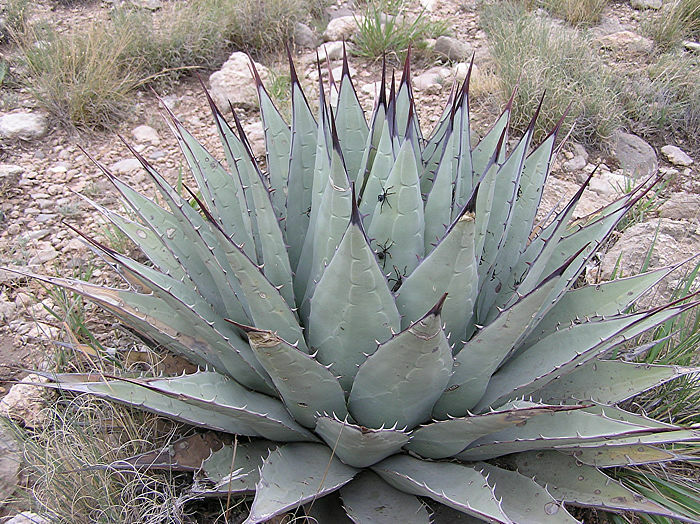 Many species of Agave are bat pollinated and produce musky perfumes as attractants. Others produce sweeter odours to attract insects. The interior of the leaves contains longitudinal fibres representing the vascular system. 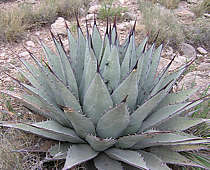 Agave leaf fibre was used by native Americans. Agave fibre from a range of species is of commercial importance, with the best quality fibre coming from the youngest leaves. Sisal (hemp) made from cultivated Agave sisalana is used to make clothing and rugs. The fibres connect to the terminal spine so the assembly can be used as needle and thread. 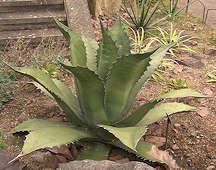 Carbohydrates stored in the core of several species of Agave were fermented by native Americans to make a beverage called pulque which was used in religious ceremonies. 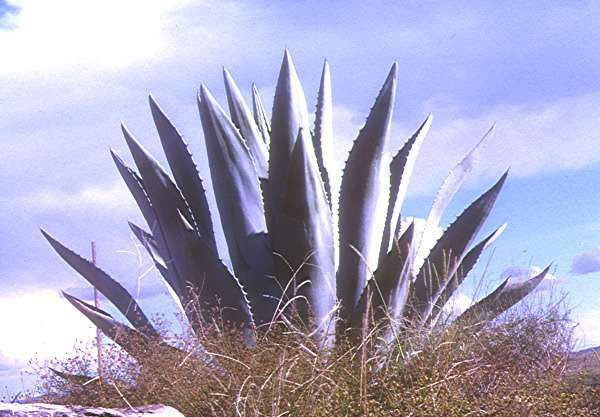 Distillation of a similar ferment made from an Agave from this the the developing flower bud has been removed is the basis for modern production of Mezcal. 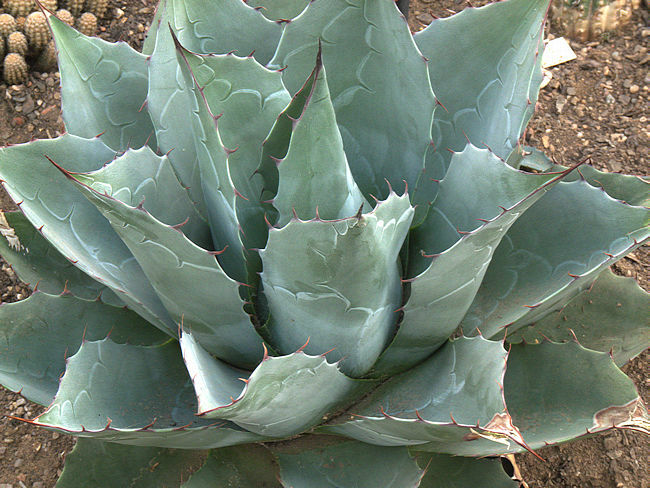 Only if made from the Blue Agave within Tequila, Mexico can the distillate be called Tequila. Desert Botanical Garden, Phoenix and Boyce Thompson Arboretum, Arizona. offsets freely but individual rosettes only have a few long narrow, blue-grey leaves up to 3 ft long, marked with bud imprints. Leaf margins have white dehiscent borders, small white teeth and grey terminal spines. The inflorescence is a spike of greenish-yellow flowers. 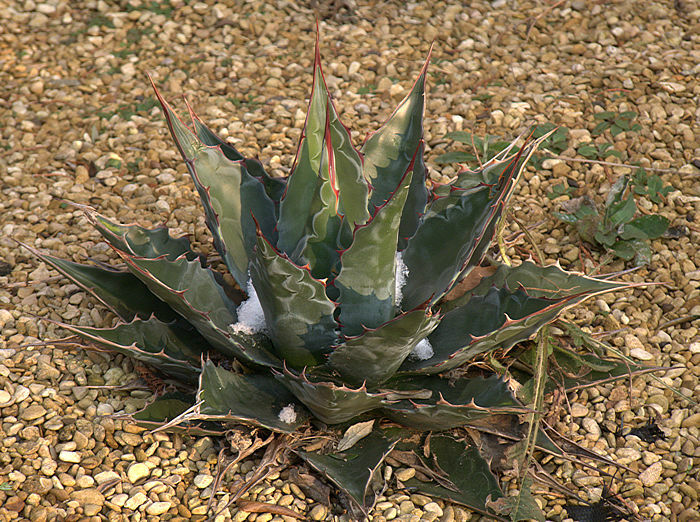 This plant is said to be cold tolerant and may be a variety or horticultural selection of A. lechuguilla. 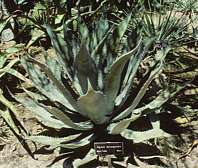 Agave americana Is the type species for the genus Agave. 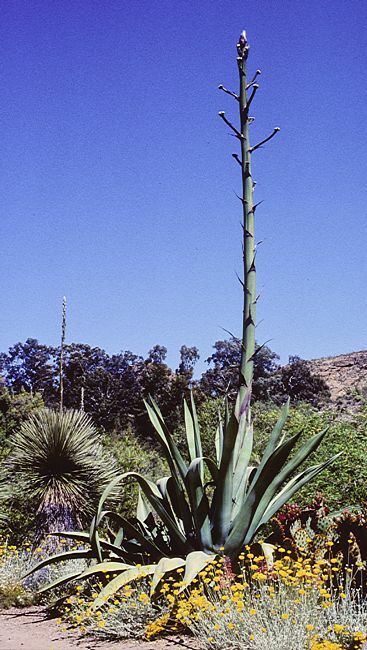 This species is probably the Agave most commonly grown as an ornamental plant, and has spread throughout the temperate and tropical areas of the world. 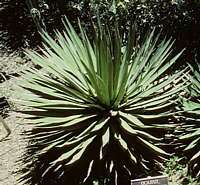 Because of extensive propagation, its exact origin is uncertain although it probably came from Mexico. 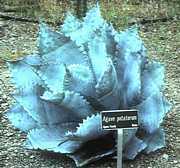 Agave americana was an early introduction to Europe from the New World and was described by Linnaeus as the type species for the genus. The huge leaves, up to 6 ft long, are an important source of fibre. The large flower stalk generally two years to grow and flower. Agave americana is undoubtably the most tolerant of all the Agaves which explains its wide feral distribution. 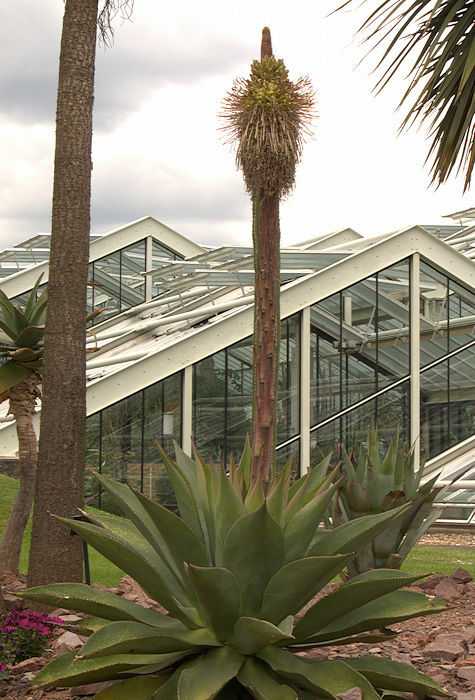 Specimens even survive in pots or in the ground in the wet winters around London and along the south coast of England. At the other extreme it may be seen planted out in the scorching sun of Southern Arizona and Texas. Upper left: Agave americana used as an ornamental succulent plant in a traffic island north of Marathon, Texas. Left: Seed head, Marathon, Texas. October 2003. 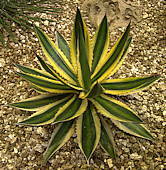 Above: A variety of variegated cultivars of Agave americana are available although these tend to be less hardy than the normal plant. 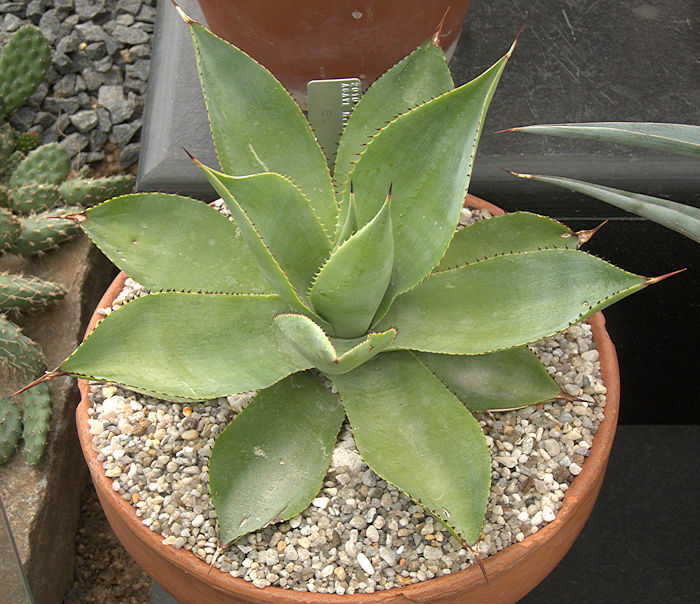 This small Agave is a rare natural hybrid between A. chrysantha x A. toumeya var. bella The rosettes grow up to a foot tall, clumping up slowly. 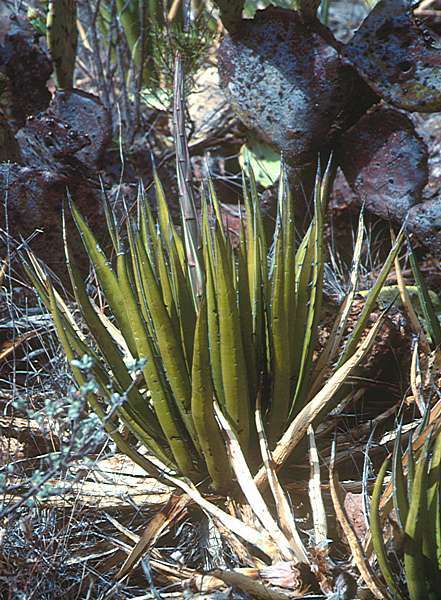 The dark-green lanceolate leaves have reddish-brown margins with well-spaced small thorns and a reddish-brown terminal spine. The inflorescence is a 12 ft spike bearing short branches with clusters of yellow flowers with exserted stamens. Native to a small region near the summit of the New River Mountains near the Maricopa-Yavapai county line North of Phoenix, Arizona. 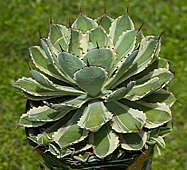 This is a very distinctive succulent plant with a large rosette of soft green leaves over 2 ft long and 5-8 in wide. Leaf tips are soft and edges smooth or very finely serrated so this plant is suitable for planting near walkways. The dense flower spike of cream to yellowish flowers generally curves in a distinctive manner. This species comes from central Mexico and although growing at around 6000 ft, will not stand any significant frost. A blue selected cultivar is available. Left: Desert Botanic Garden, Phoenix, Arizona, mid-April 2006. This species will only tolerate a slight frost despite growing at up to 6000 ft in the mountains of Mexico. The solitary rosettes can grow up to 6 ft in diameter, so make a splendid specimen. 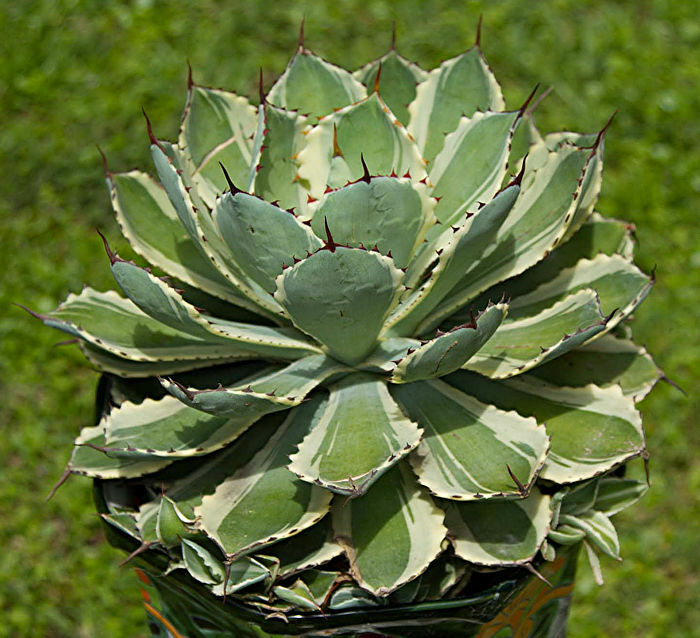 A distinctive succulent plant with medium-sized open rosettes of long 1-2 inch wide recurving leaves, offsetting freely to form a mound. The leaf margins are minutely serrated and without a terminal spine, so this species is suitable for planting near paths. The inflorescence (right) is a short, dense spike of white or pale yellow flowers. 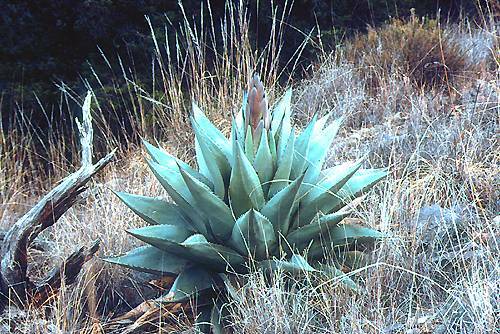 Unlike most Agaves, this species is not strictly monocarpic although often so. 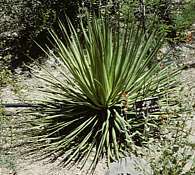 Native to the high Coahuilan Desert of the Mexican states of Coahuila and Nuevo Léon. May be hardy enough to withstand the cold-wet English Winter. 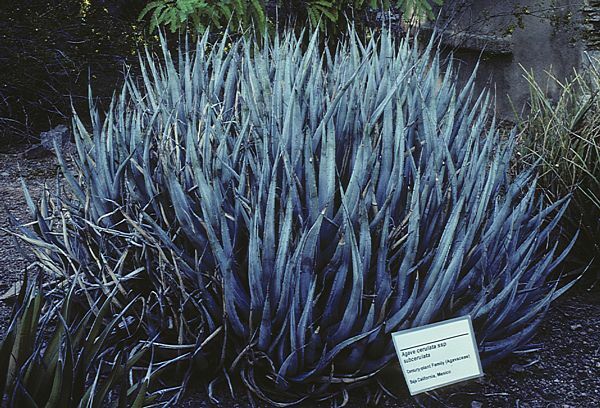 A fine glaucous blue plant, growing in large clumps with narrow pointed leaves bearing widely-spaced small marginal teeth. 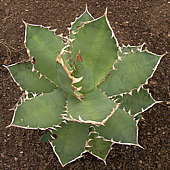 There are a number of forms and subspecies of Agave cerulata, differing in leaf colour and the distribution of marginal teeth. 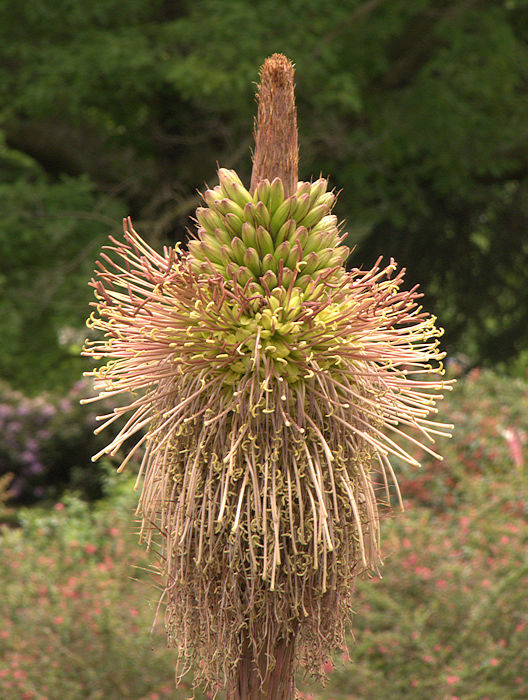 The flower stalk up to 12 ft tall bears a panicle of pale yellow flowers. 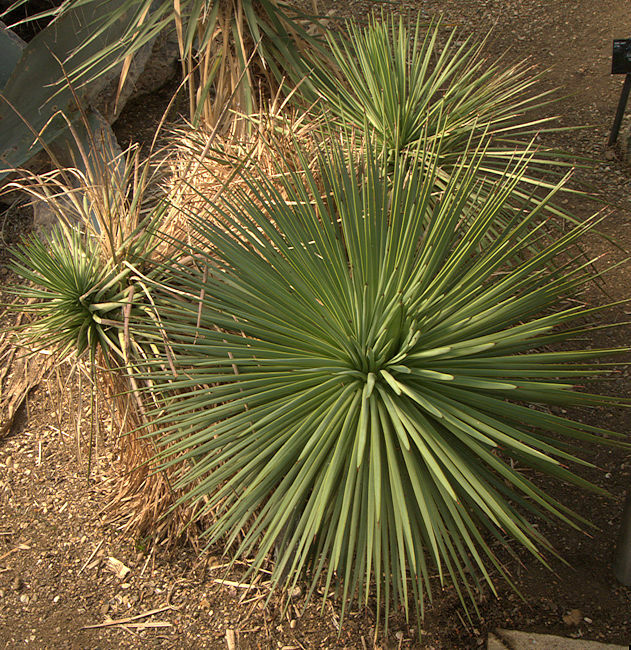 Seen here at the Desert Botanic Garden, Phoenix, Arizona. 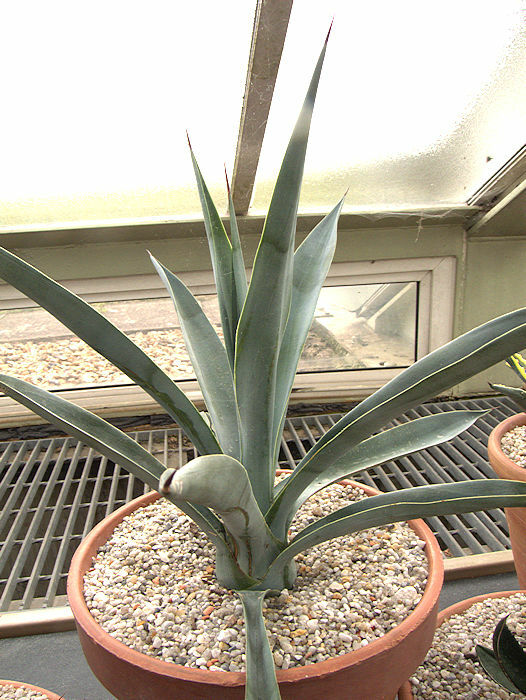 left: Agave cerulata var. subcerulata photographed in the Boyce Thomson Arboretum, Arizona. 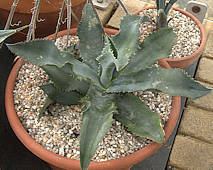 Agave cerulata var. 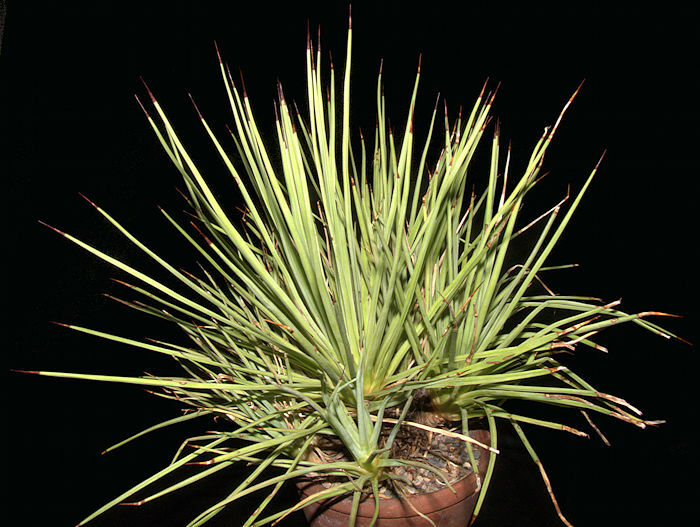 subcerulata is native to Western Mexico including Baja California, growing below 3000 ft. It is very tolerant of hot dry conditions. The open rosette has smooth, light green leaves up to 20 in long. Leaf margins are undulate with tiny dark brown triangular teeth closely spaced along the edge. 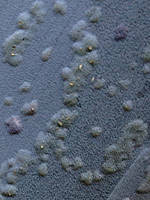 Rosettes may offset at their base to form a clump. The inflorescence is a 6 ft spike. The upper third bears greenish-yellow flowers with reddish-brown exserted stamens. Native to the Southern Mexican state of Chiapas where it grows on limestone. Seen flowering outside the Princess of Wales Conservatory, RBG Kew, June 2010. A striking plant for a tropical planting but will not stand significant frost. 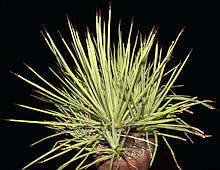 is a similar plant to A. chiapensis but the thinner leaves have whitish marginal teeth when young and a much weaker terminal spine . A handsome glaucous blue rosette, usually solitary or offsetting sparingly. The leaves bearing bud imprints and some banding are up to 10 in long and 7 in wide. Leaf margins are undulated. The inflorescence is a panicle of yellow flowers. 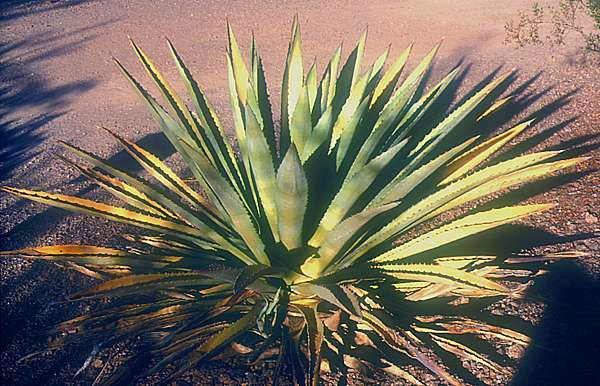 Agave colorata is native to Coastal Sonora, Mexico. 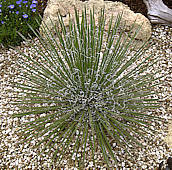 It makes a fine specimen for a dry, low desert garden. Flowering at the Desert Botanic Garden, Phoenix, Arizona, mid April 2006. 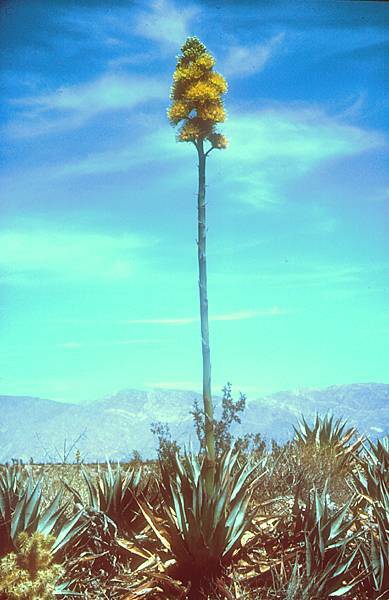 These Desert Agaves were part of a fine stand of flowering plants in the San Felipe Wash, Anza-Borrego Desert State Park, California in April 1995. 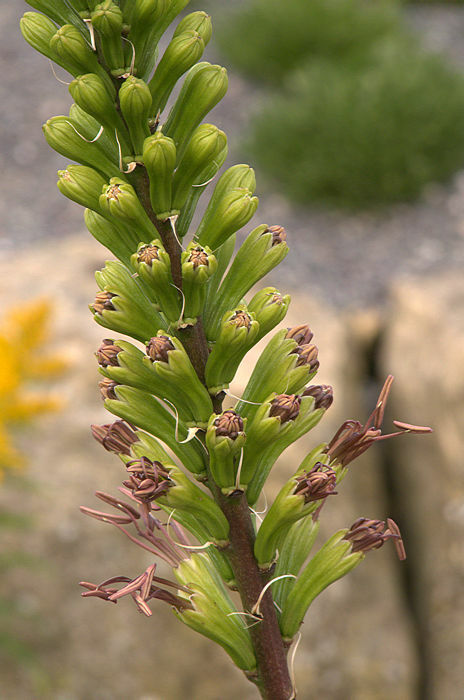 Sometimes called the "century plant", in practice flowering occurs after 8 - 20 years. Although all the flowering plants will die, each group of plants at this site had plenty of offset non-flowering rosettes for other years. The leaves of the rosettes are armed with lethal stiff terminal spines, for which one rapidly aquires respect, and sharp marginal teeth. 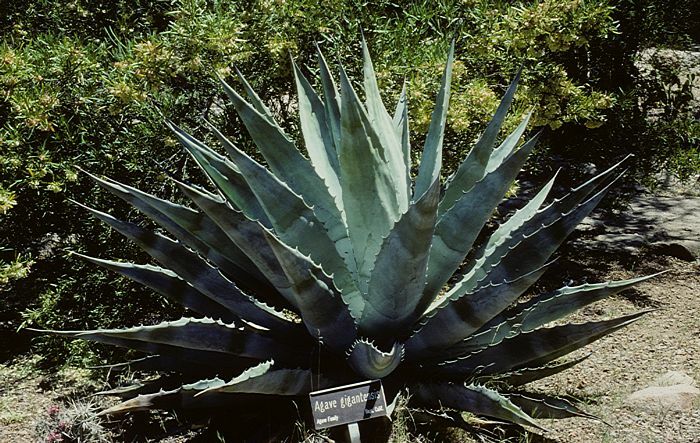 Desert Agave is one of the most drought-tolerant of the 136 species of agave found in north America, and grows on stony terraine from south-eastern California and south-western Arizona to Baja California and northern Sonora. The starchy core of this succulent plant was baked in rock-lined pits by desert-dwelling Indians to form a nutritious energy-rich staple food. 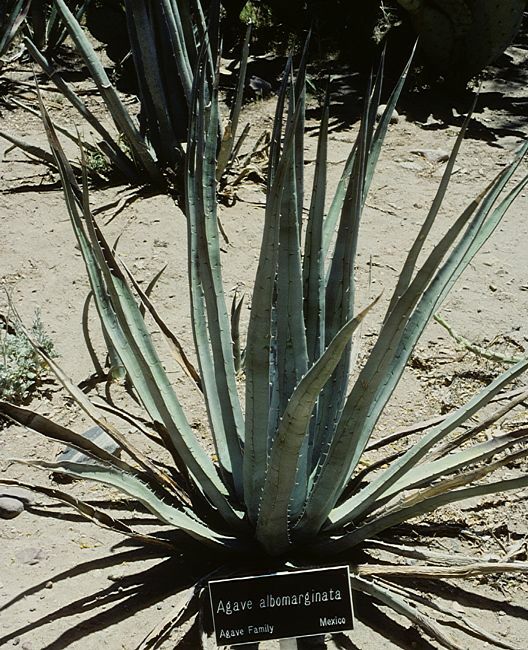 Baked agave can still be purchased in Mexican markets. 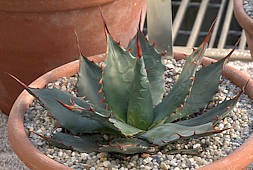 This medium-sized Agave forms an architectural urn-shaped rosette from thick, 3 ft long green leaves without marginal teeth or with very small ones on immature growth, but with a brown sharp terminal spine. 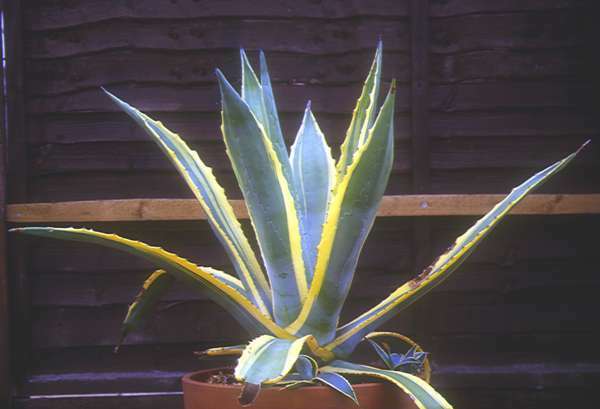 The variegated form shown has bright green leaves with yellow margins. The branching 10 ft inflorescence of yellow flowers produces many bulbils which may be used for propagation as may the many basal offsets. Only known from cultivation but probably originating from Mexico. Drought tolerant. May survive light frosts. 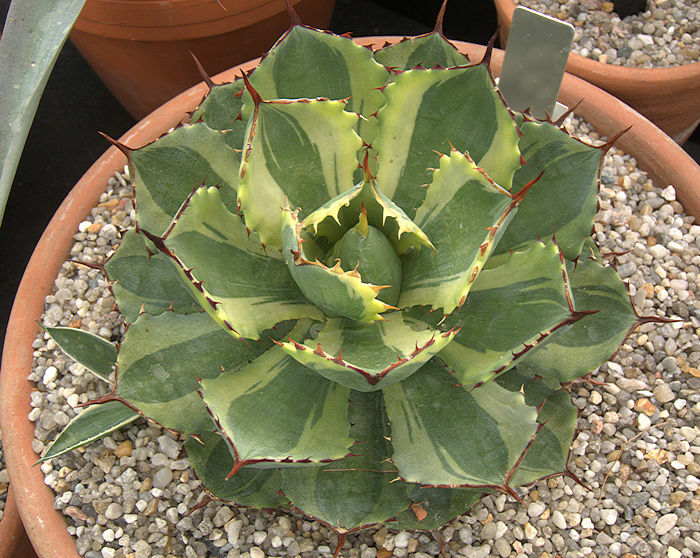 Photo: Agave desmetiana variegata, Michael Thau 2015. 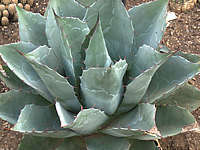 This Agave has a medium-sized rosette of long, narrow grey-green leaves with teeth along the leaf margins and a sharp grey-brown terminal spine. The leaves have a variable pale stripe running longitudinally along their centre. 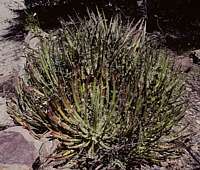 The plant offsets freely at its base to form large clumps. 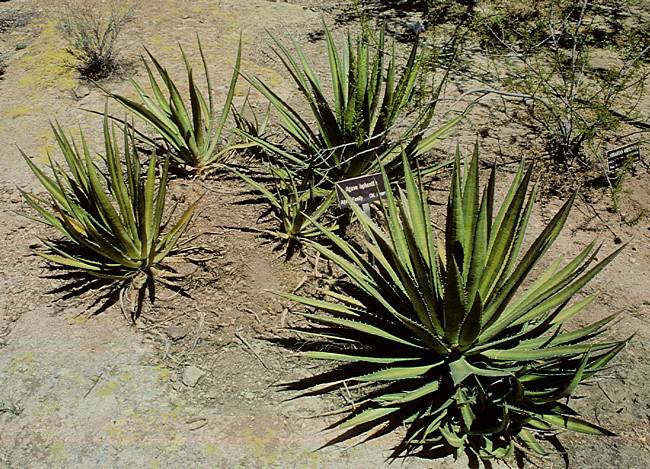 Native to limestone soils of the Sierra Madre Oriental in the Mexican states of San Luis Potosi and Hidalgo. The leaves contain soapy saponins that are used for washing. forms a large rosette of up to 6 ft across. The pale bluish leaves have wickedly spined margins and prominent apical spines. 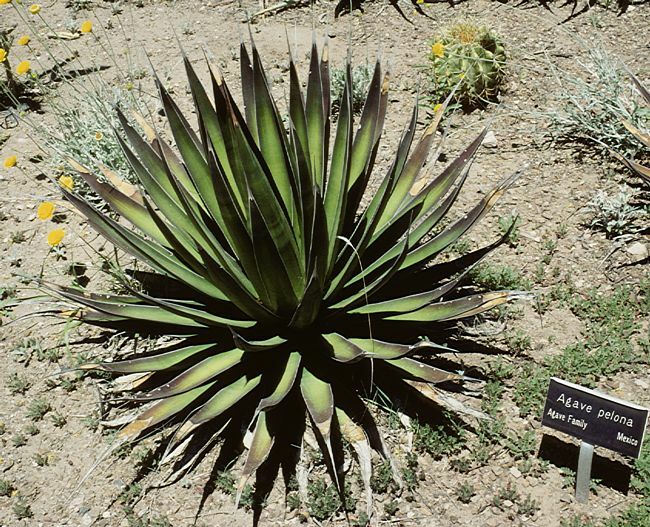 Agave durangensis is native to Durango and Zacatecas, Mexico, growing among rocks at up to 8500 ft. It is moderately hardy to dry and cold conditions. The inflorescence is a panicle of bright yellow flowers. Photographed in the Boyce Thompson Arboretum, Arizona. This variable species has a dense, medium-sized rosette of lanceolate dark-green leaves with white bud-impressions and white filaments along their otherwise smooth margins. The leaves terminate in a brown spine. The inflorescence is a short, dense spike of greenish-purple flowers with exserted stamens. Widely distributed across Southern Mexico (Hidalgo, San Luis Potosi, Veracruz). Many sub-species have been described, of which four are currently recognised. 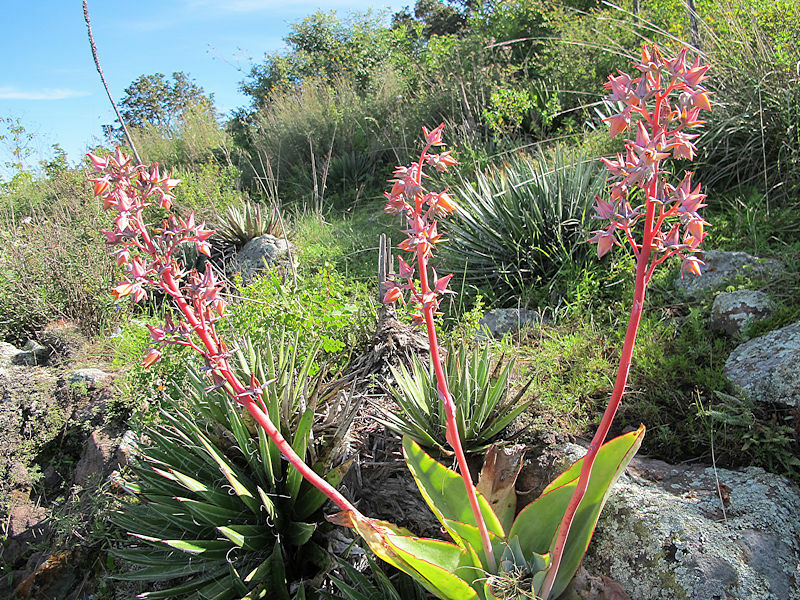 Left: Echeveria subrigida in front of Agave filifera in the Picachos Mountains, Guanajuato, Mexico. A horticultural intra-specific hybrid between A. filifera ssp. filifera x A. filifera ssp. schidigera whose leathery leaves have particularly prominent curly white marginal filaments and very sharp terminal spines. The inflorescence is a spike of flowers with greenish sepals and exserted red anthers with bright yellow anthers. 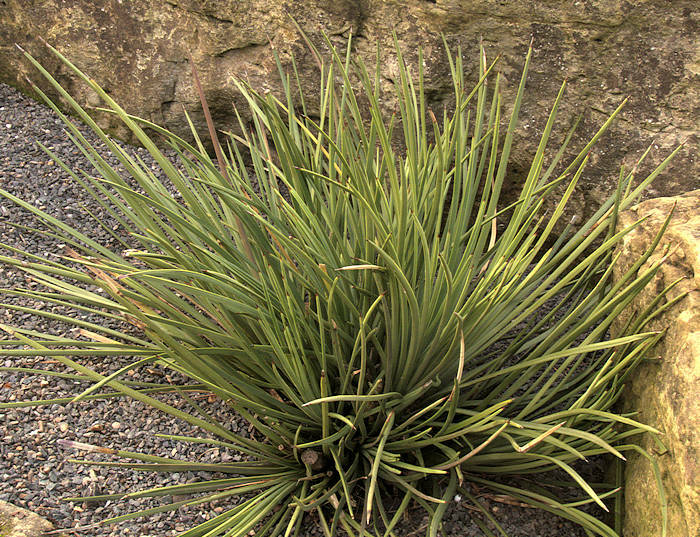 This plant forms a clump by suckering and has the potential to be invasive in warm climates. Both parents in this cross are moderately frost-hardy. 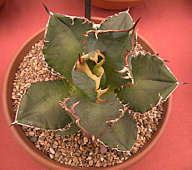 A variegated form ( A. x leopoldii 'Hammer Time' ) is in circulation. is a clumping plant with linear yellow-green leaves up to 3 ft long. Leaf margins are undulate with small teeth and a prominent, grey terminal spine. A pale or yellowish stripe runs longitudinally along the middle of the leaf. The upper third of the 15 ft flower stem is a raceme of grey-green flowers with prominent bright yellow stamens. This species is native to Hildago, Mexico, growing at 1000-6000 ft. Photographed in the Boyce Thomson Arboretum, Arizona. 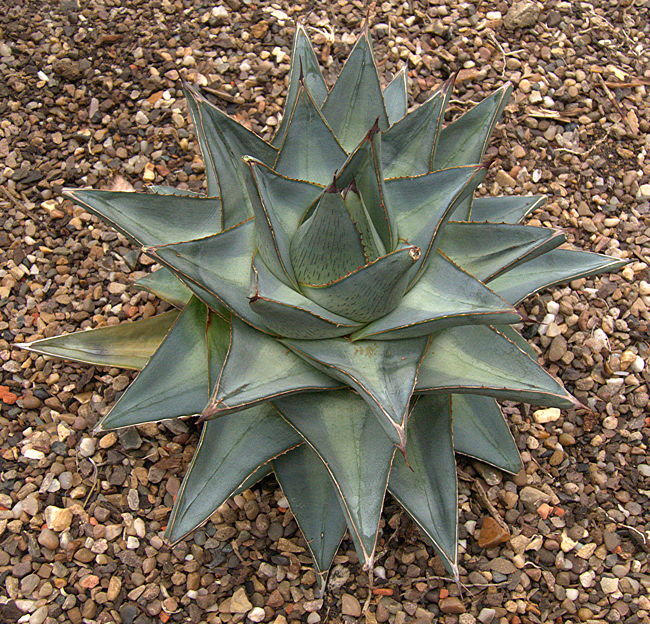 This solitary, short-stemmed Agave has dense, symmetrical rosettes of many (100 - 200) linear, stiff dark green leaves. The leaf margins have rounded edges with white lines and curled filaments to a variable extent. Cultivated speciments tend to be selected for prominent filaments. The inflorescence is a tall 15 ft, unbranched stem with many yellowish-green flowers tinged with red along its length. Stamens are exserted. Native to a restricted area of oak forests at elevations of 3300 - 4600 ft in the Mexican state of Nayarit. This succulent plant is quite sensitive to frost. has a solitary rosette up to 4 ft in diameter. 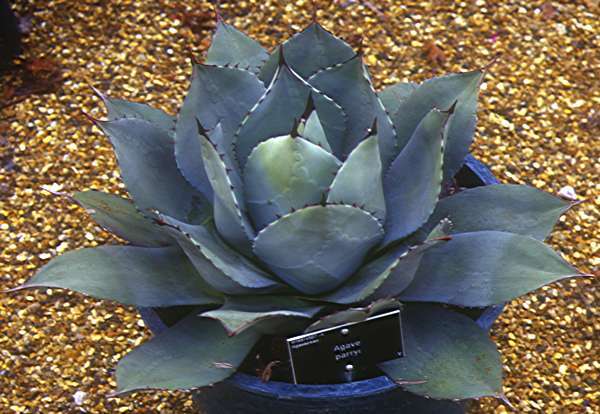 The rigid, thick blue-green succulent leaves are marked with bud imprints and have undulate margins with prominent curved teeth. The inflorescence is a 15 ft panicle of pale yellow flowers. 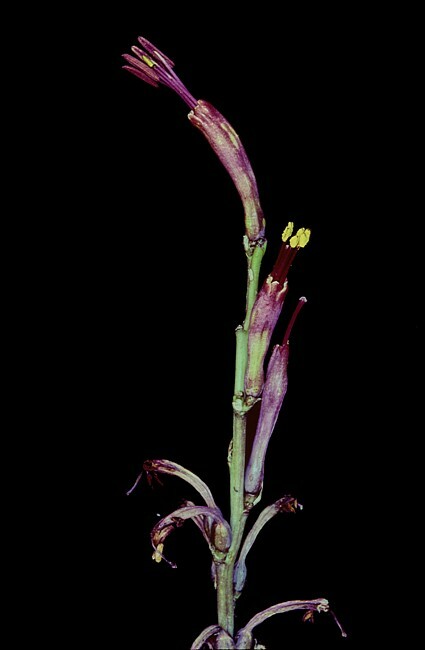 This species is limited to central Baja California, growing from 2000 to 5000 ft. 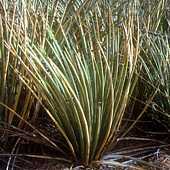 It is a splendid ornamental for a Mediterranean climate and used in its native area for the production of Mezcal. Photographed in the Boyce Thomson Arboretum, Arizona. 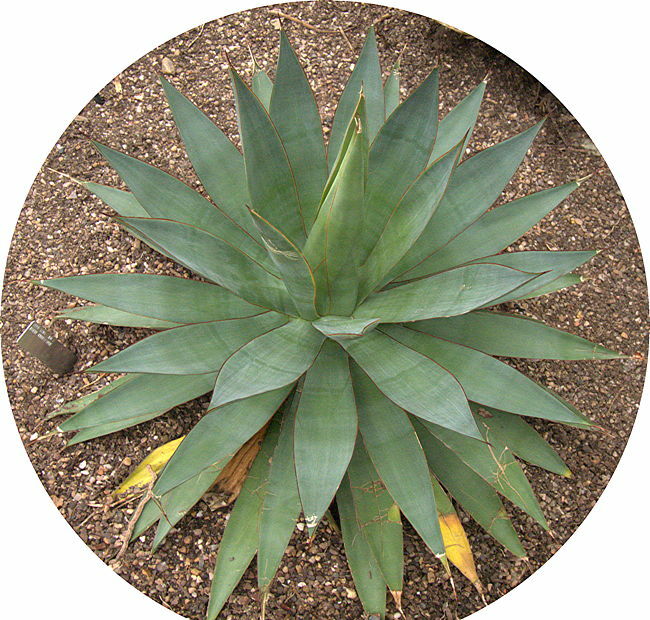 The solitary rosette of this medium-sized Agave grows up to 2 ft in diameter. The thick, succulent leaves are blue-grey with distinct bud imprints. The serrated leaf margins have big reddish-brown spines and there is a thick dark brown terminal spine. The inflorescence consists of 15 - 20 umbels of yellow flowers arranged along on the top half of a 12 ft stalk. Native to the Mexican states of Jalisco and Nayarit, especially rocky hills West of the city of Guadalajara and around the Ceboruco volcano. 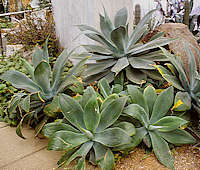 This Agave forms open rosettes of lanceolate, bluish-grey, brittle leaves up to 3ft long, with a characteristic twisted or undulate appearance. Leaf margins have irregular, warty teeth with small thorns. The inflorescence is a 10ft flower stalk branching towards its top with clusters of long, tubular orange-yellow flowers. Flowers are followed by bulbils. Native to forests on limestone and gypsum soils at modest elevations (1000 - 3300 ft) in the Mexican states of Jalisco, Michoacan and Guerrero. 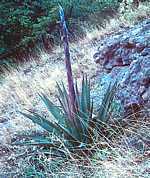 growing in the basin region within the Chisos mountains of the Big Bend National Park, Texas in April 1990. 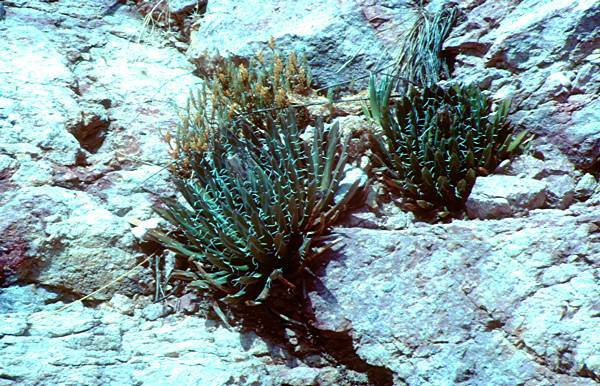 Typically of this species, the plants in this location were growing as solitary rosettes. The annual precipitation is higher and the climate cooler in this region of the park than on the desert floor and these plants were growing in grassland among mixed deciduous and coniferous forest. The flower bud has just started to develop, and at this stage the Apache used to roast and eat the core of this succulent plant. 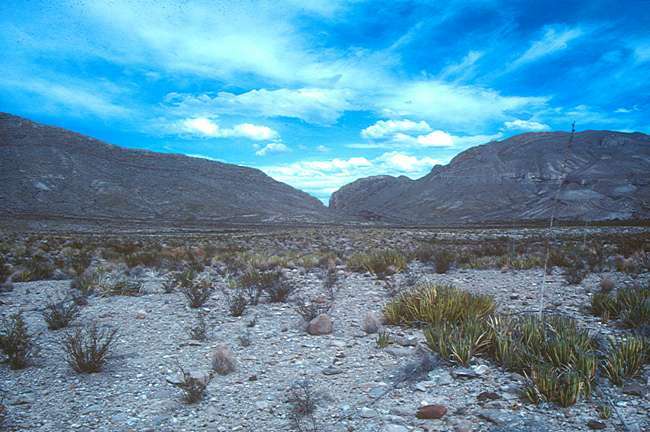 Left: growing in the Big Bend National Park, Texas mainly on compacted broken limestone in front of Dog Canyon. April 1990. 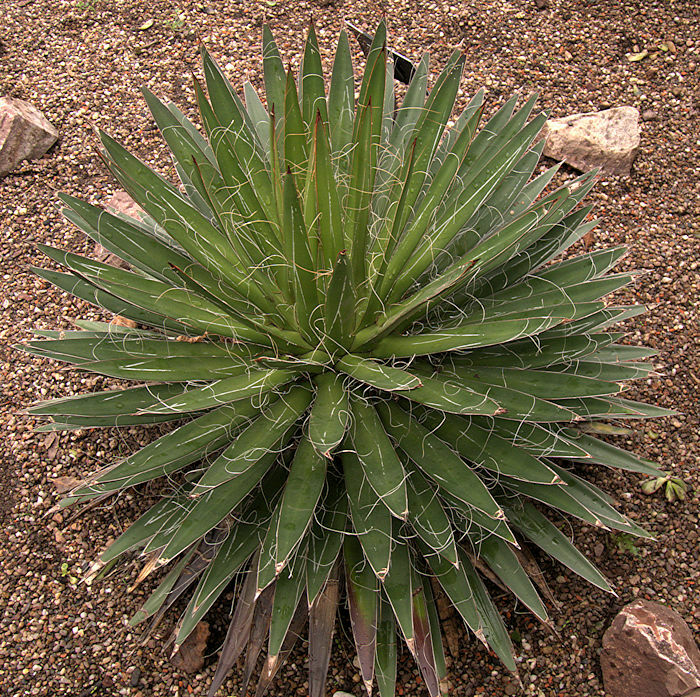 Agave lechuguilla is one of the principal indicator succulent plants of the Chihuahuan desert, where it grows very freely on most soils, spreading vegetatively by stoloniferous shoots, which are soft enough to be browsed by javelinas. The stiff, erect leaves are tipped with surgically sharp needles which injure the legs of people or animals that brush against them. After up to 15 year's growth, depending on the annual rainfall, the plant has stored sufficent reserves in its starchy core to flower. This involves production of a flower stalk (left) up to 15 ft tall, although 6 - 10 feet is commoner. After flowering and production of seed, the plant dies. 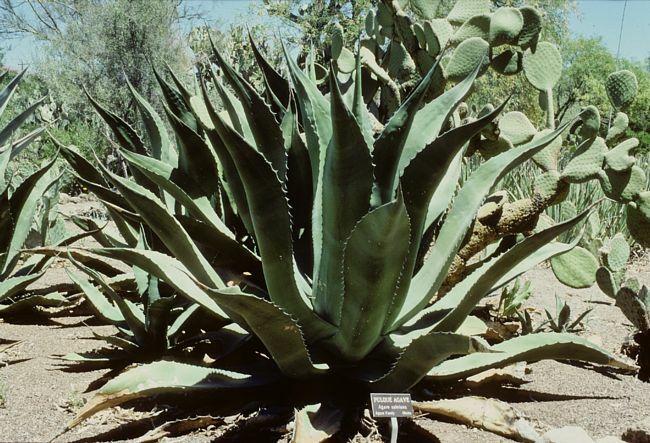 Uses include fermentation of the sap from the flower stalk to make an alcoholic liquor (pulque) from which Mezcal can be distilled. Fibres from the leaves are used to make a variety of woven products such as ropes, mats and baskets. 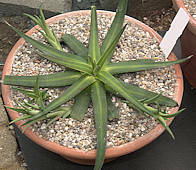 is a medium-sized succulent plant, offsetting at the base, with narrow rigid leaves 2 ft long and 1-2 in wide forming a rosette with an open appearance. Leaves may have a yellowish longitudinal stripe down their middle and leaf margins have numerous small straight or curved teeth and a grey or brown terminal spine. 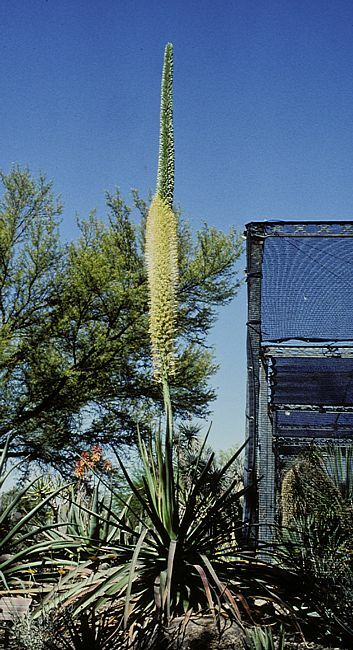 The 12 ft flower spike carries pale greenish-yellow flowers. 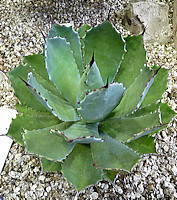 Agave lophantha occurs in the Rio Grande valley, Texas and into Mexico. It can be confused with Agave lechuguilla with which it hybridises. 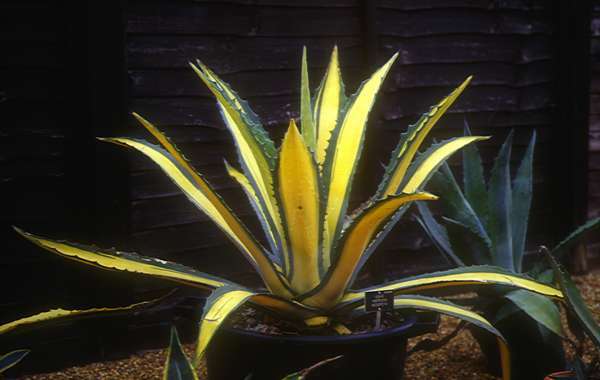 This selected form of Agave lophantha has variegated leaves in which up to four colours can be distinguished, especially in full sun where the edges of the marginal yellow stripes colour up red. 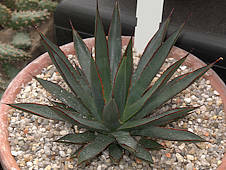 Large plants are very ornamental although the reddish sharp marginal teeth and wicked terminal spines means that this is not a succulent plant for the faint hearted. This is a tender succulent plant from the Mexican states of Oaxaca and Puebla and will not stand any frost. The decorative blue-grey rosettes grow up to 16in and offset freely at their base. Their blue-grey leaves have sharp, dark brown terminal spnes and their margins are funished with dark brown thorns. 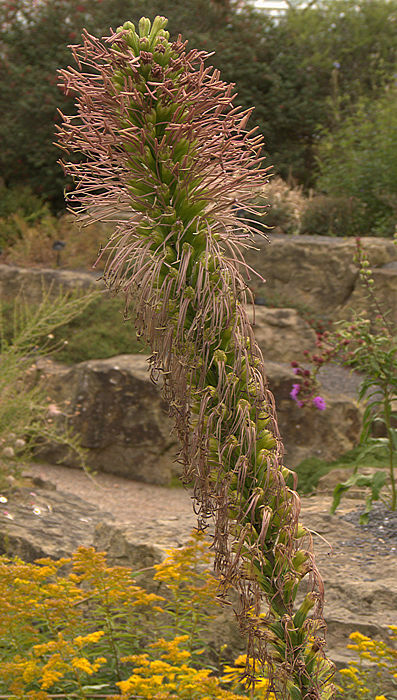 The inflorescence is up to 6 ft tall with greenish flowers. Left: Photographed at the Desert Botanic Garden, Phoenix, Arizona September 2004. Left: Agave macroacantha makes a handsome pot plant. It should be watered from below to preserve the silvery bloom on the leaves, which is lost on plants experiencing rainfall in their habitat. 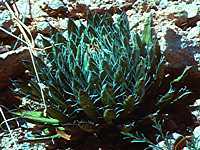 The solitary glossy dark green rosettes are formed from tapering lanceolate leaves whose edges are furnished with many tiny dark brown teeth and terminate in a sharp brown spine. 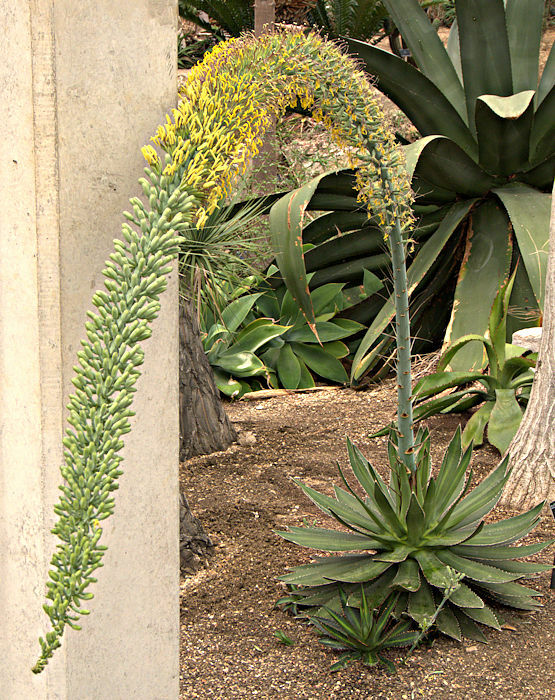 The inflorescence is a 20 ft stalk, branching along the upper third to support yellow flowers. Native to Puerto Rico and the U.S. Virgin Islands. Photographed at RBG Kew. The light green leaves up to 2 ft long have many tiny whitish teeth along their edges, becoming brown as the leaf ages, and terminate in a long brown spine. Plants will clump up by offsetting. Some forms have no teeth. Native to cloud forests of mountains in the Mexican states of Hidalgo, Tamaulipas and San Luis Potosí and said to tolerate moderate frosts. 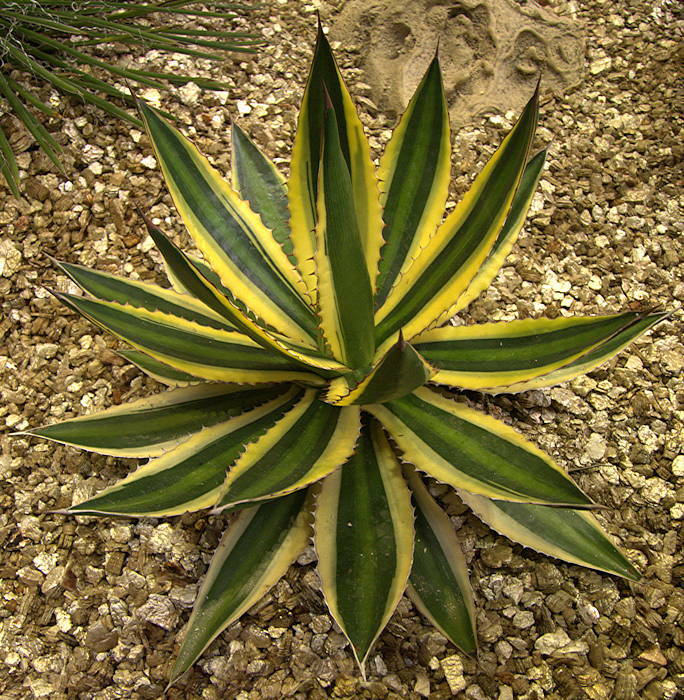 The selected form Agave mitis 'Multicolor' has cream edges to the leaves. The rosette is formed from pale glaucous-green leaves, the margins of which have extremely small brownish teeth. The purple inflorescence is about 3ft tall. The leaves of Agave mitis var. albidior 'Silver Anniversary' have a silvery farinose coating and must be handled carefully and watered from below to avoid marking the leaves. 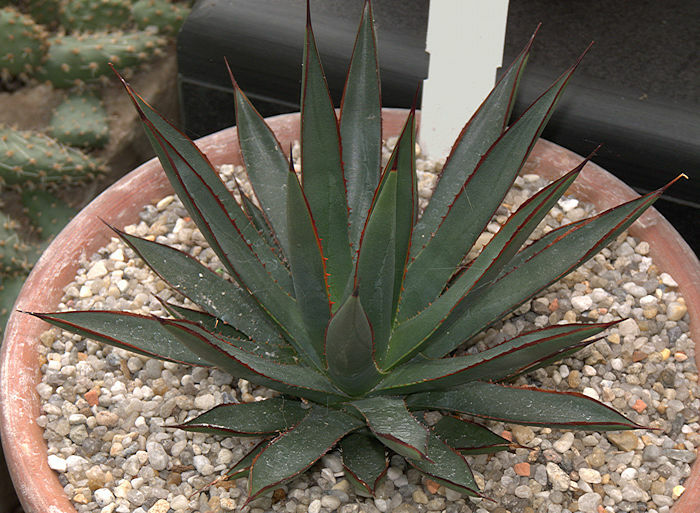 This succulent plant has a tight rosette of broad blue-green leaves with fierce marginal reddish teeth and a prominent terminal spine. The leaf surfaces have prominent glaucous bud imprints. The rosette may become 3 ft or more wide, but remains solitary. The inflorescence is a compact, branched panicle of yellow flowers, on an unusually stout stalk with tight overlapping bracts. Native to cool wet pine, oak forests above 9000 ft mountains of Nuevo Leon, Northern Mexico and said to tolerate the cold-wet English Winter. Despite its recent discovery, seedlings are widely available in plant nurseries. at the Desert Botanic Garden, Phoenix, Arizona. 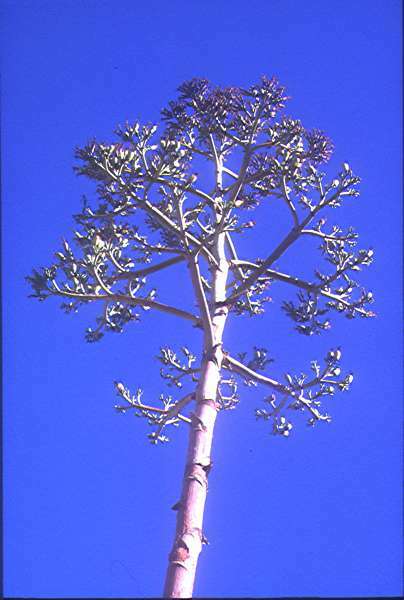 This Agave grows in central Arizona at elevations of up to 3000 ft, but its distribution is thought to reflect relics of cultivation as it was used for food. 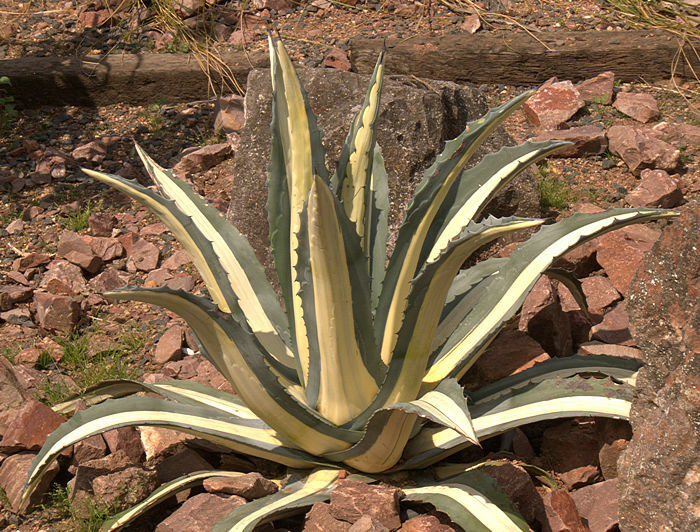 It is still cultivated in Sonora, Mexico. The original distribution is unknown. The 2 ft lanceolate leaves have small brown marginal teeth, crossbanding and a clear bud imprint. They become concave towards their ends. The clumps spread by offsetting. The 12ft tall panicle of yellow-green flowers produces a profusion of bulbils. 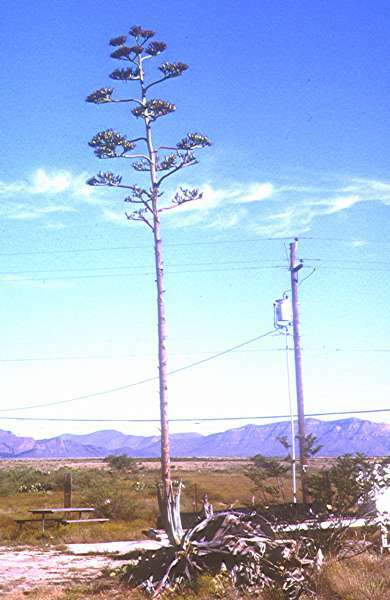 left: Agave murpheyi near McGraw, Arizona. 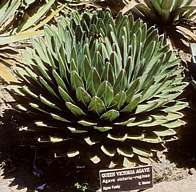 Agave nizandensis has a small stemless, rosette up to 2 ft in diameter formed from soft, dark green leaves with a longitudinal pale green stripe. Leaves have well-spaced minute marginal teeth and blunt, reddish terminal spines. 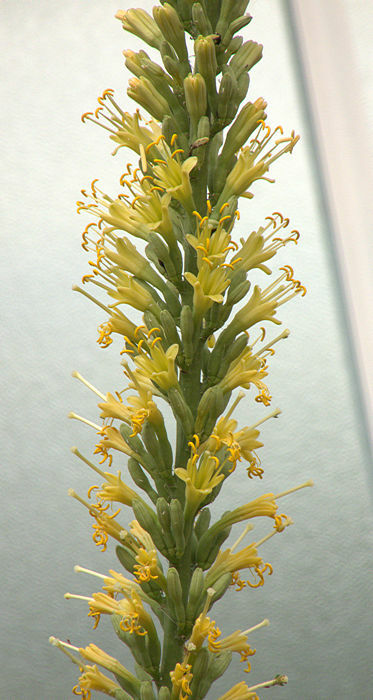 The inflorescence is a 3ft spike of greenish flowers. Rosettes clump up slowly via stolons. Native to steep limestone slopes in the Mexican state of Oaxaca where it is rare and endangered. This is an understory plant from dry forest so prefers slight shade rather than full sun, colouring up red in strong light. has stiff, smooth, dark green leaves 10-20 in long, with a dehiscent brown border but no marginal teeth and a weak, flexible spine. The rosette generally remains solitary. The decorative 10 ft spikes of pale yellow flowers are quite distinctive. 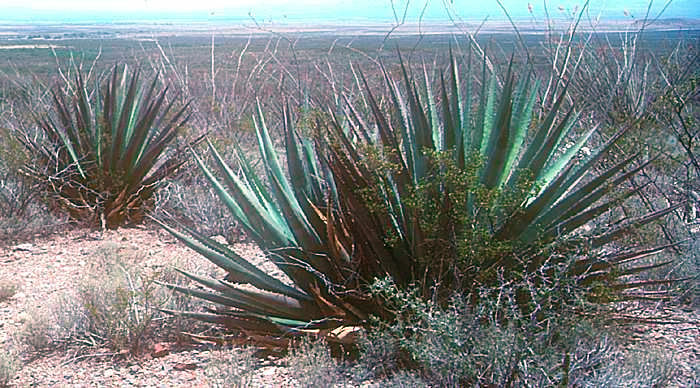 left: Agave ocahui is native to moderate elevations in north-eastern Sonora, Mexico. 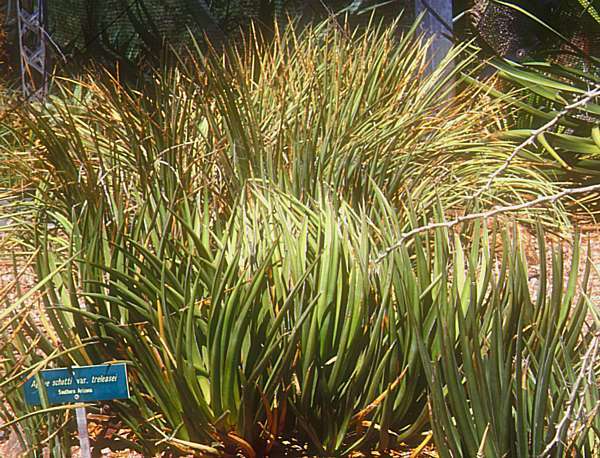 It is said to withstand some frost in dry climates and is widely grown as an undemanding ornamental plant. The leaves are a source of strong fibres (ocahui=cord) and also contain the saponin smilagenin which can be used as a detergent. Photographed in the Boyce Thompson Arboretum, Arizona. flowering (right) at the Desert Botanic Garden, Phoenix, Arizona, mid-April 2006. The stiff smooth leaves of this less-common variety are up to 3 ft long and 1 in wide and without marginal teeth. 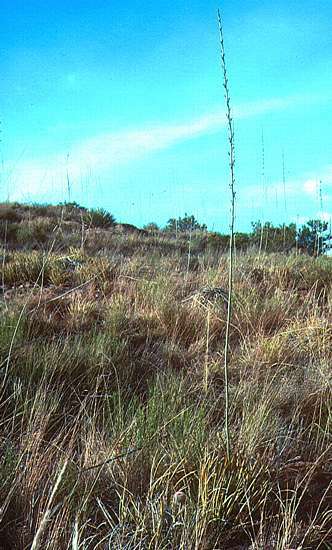 with a developing flower spike and lanceolate leaves, growing in the Coronado Memorial Monument, Coronado National Forest, Arizona. May 1997. 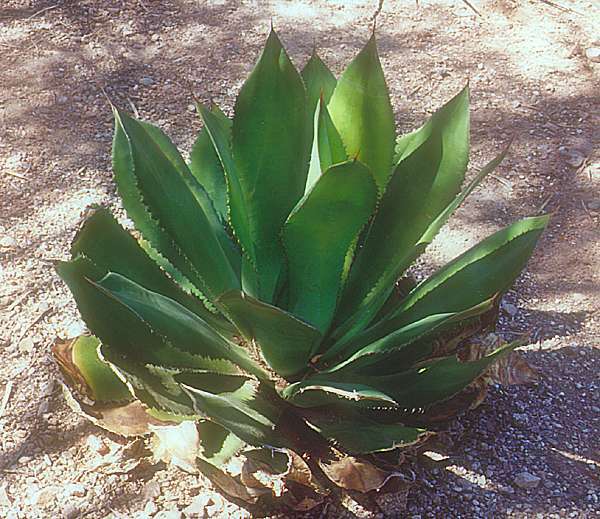 Agave palmeri is distributed in south-eastern Arizona, south-western New Mexico and adjoining states in Mexico at 3000 - 6000 ft above sea level and prefers limestone soils. Uses include production of Mezcal from the starchy core and fibre from the leaves. The growing bud can be roasted and eaten. 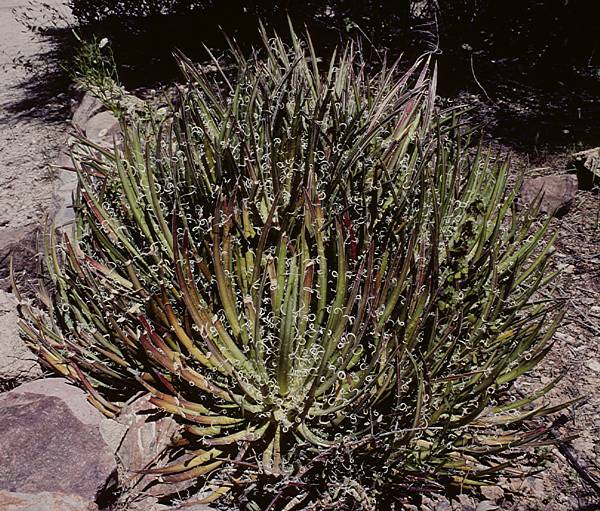 forms a medium-sized 2 ft rosette with glaucous blue leaves bearing marked bud imprints, curved reddish-brown thorns on the leaf margins and a wickedly-sharp, reddish-brown terminal spine which may be curved. 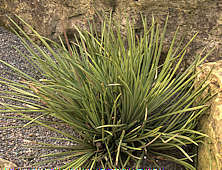 The plant can form a clump by offsetting at the base. The inflorescence is a panicle of red buds opening to yellow flowers, supported by a 12 ft stem. This species is native to the mountains of Coahuila, Mexico, growing above 4000 ft and is reported to be moderately frost hardy, but also tolerates summer heat well. A handsome plant for dry landscaping. flowering in the Devil Mountains, Organ Pipe National Monument, Arizona. May 1997. 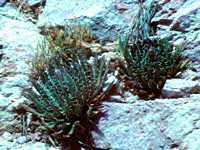 Plants may be solitary or clump and several varieties have been described. The pale yellow flowers are carried on a 20 ft inflorescence. 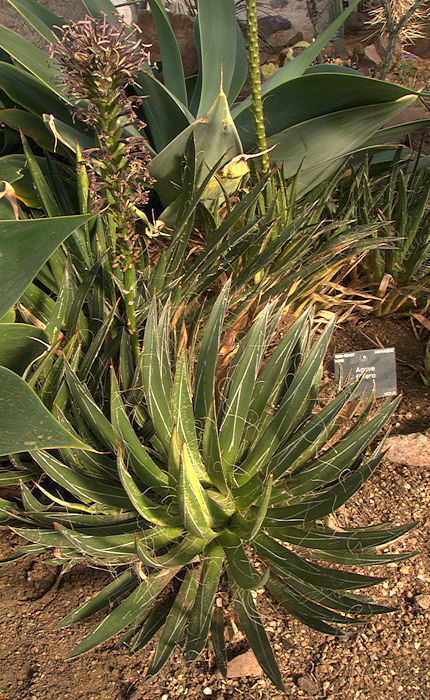 This succulent plant has been traditionally used for making Mezcal and is widely used as an ornamental plant for the dry garden. The neat blue grey rosette of Agave parryi makes a handsome specimen in cultivation. As suggested by its wide distribution through Arizona into New Mexico (left) and northern Mexico at 1500 - 8000 ft above sea level, this species is tolerant of a range of cultural conditions including a substantial degree of cold hardyness. 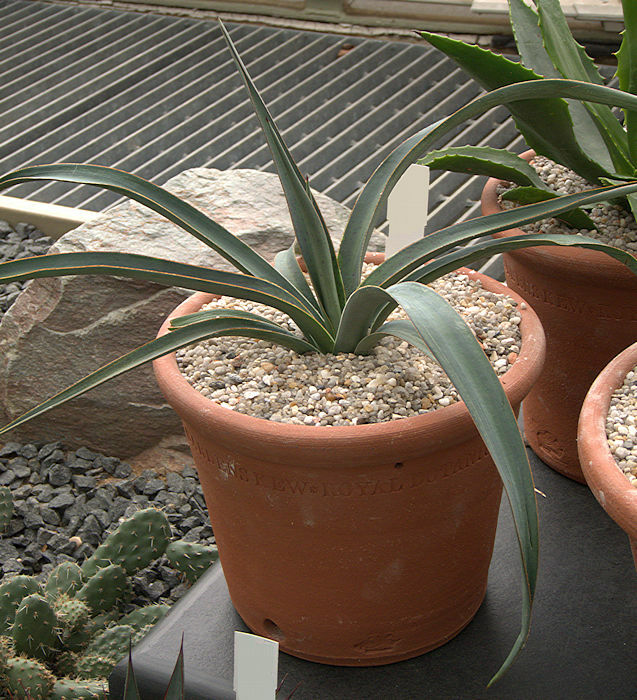 However, it experiences dry cold in habitat and may need some protection from a wet winter, although seen here (extreme left) growing outside in a protected corner of RHS Wisley during the English winter. flowering on a sloping granite rock face alongside the Ruby Road, Arizona. May 1997. The flowers are pale yellow along a stem 3-6 ft tall. This species has a limited distribution in southern Arizona and northern Sonora, Mexico. In cultivation, this attractive minature requires full sun and minimal watering to maintain the compact short-leaved form. 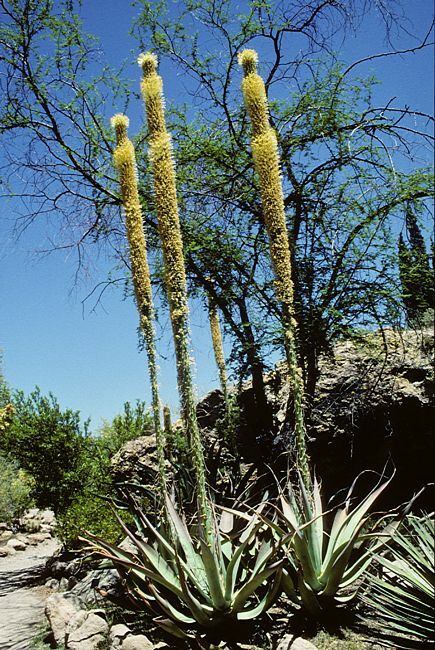 is similar to Agave ocahui but its dark green leaves have a reddish tinge towards their tips, a dehiscent white border and a stronger grooved terminal spine up to 3 in long. The rosette is solitary and produces an unusual 10 ft raceme of reddish bell-like flowers. 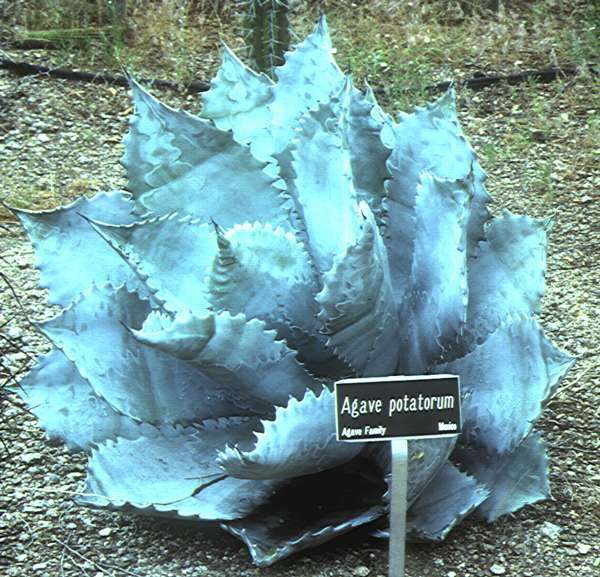 Agave pelona is native to North-Western Sonora, Mexico and was a source of fibre and roasted Agave hearts for indigenous people. Photographed in the Boyce Thomson Arboretum, Arizona. 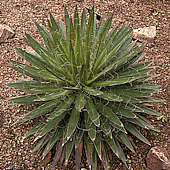 has a very similar rosette of leaves to Agave parviflora, with which it is often confused, but has pink flowers. Agave polianthiflora grows on rocks in Northern Mexico at 4000-6000 ft. 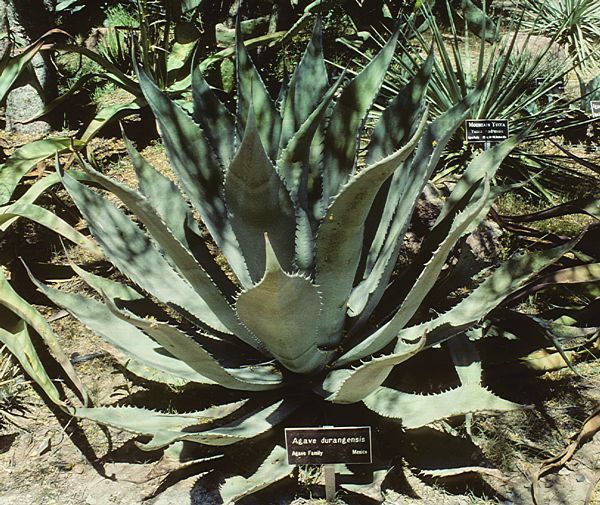 The specimen shown here was bought as Agave parviflora but is probably Agave polianthiflora. 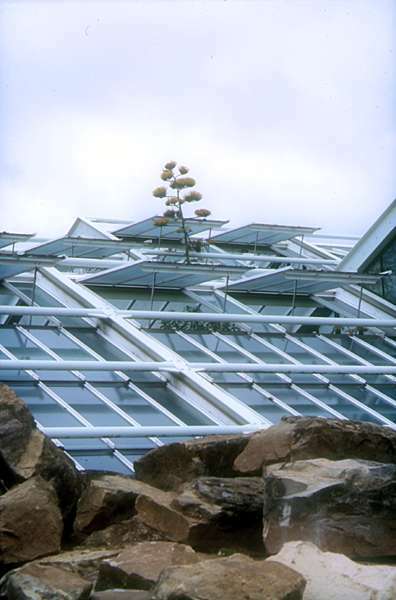 It is moderately hardy and, potted up in granite chippings to provide free drainage, has survived outside through several English winters under a half plastic bottle as protection from excessive wet. It finally flowered during an indifferent summer and has produced several offsets. 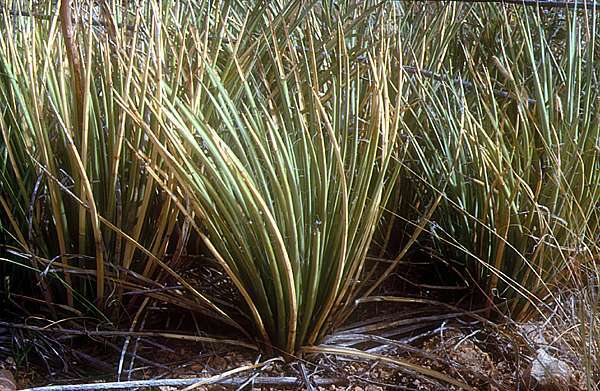 With fleshy blue-grey succulent leaves whose undulate margins are decorated with brownish thorns, this is one of the choicer small Agaves for the collector and many varieties have been described. 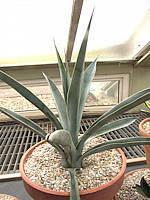 This subtropical Agave grows 4500 - 7500 ft above sea level in Puebla and Oaxaca, Mexico and is not frost hardy. 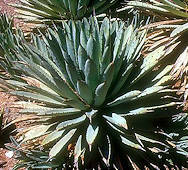 Agave potatorum (Tobalá) is the most popular wild Agave for making Mezcal. 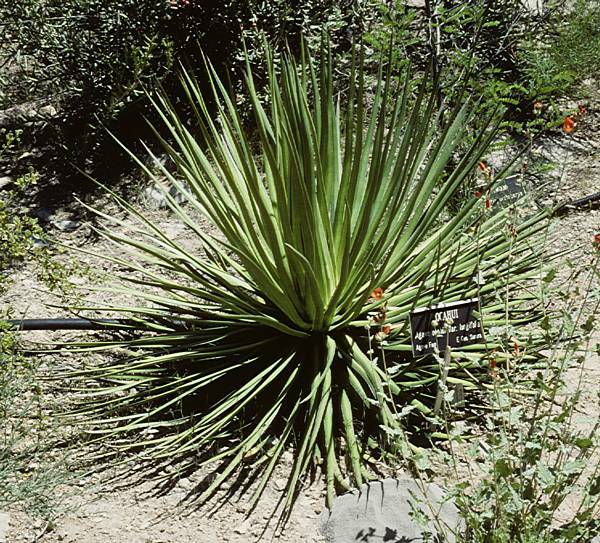 This specimen was photographed in the Boyce Thomson Arboretum, Arizona in May 1997. 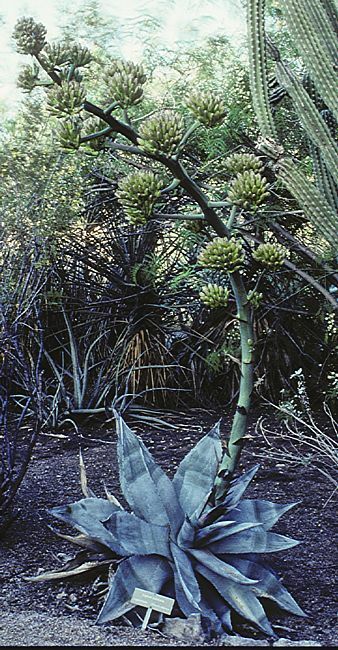 Agave potatorum Zuccarini 1832 cv. Kichijokan 'Desert Diamond' hort. Syn. 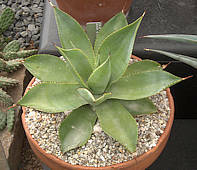 Agave verschaffeltii A. Berger 1915 'kichiokan' hort. 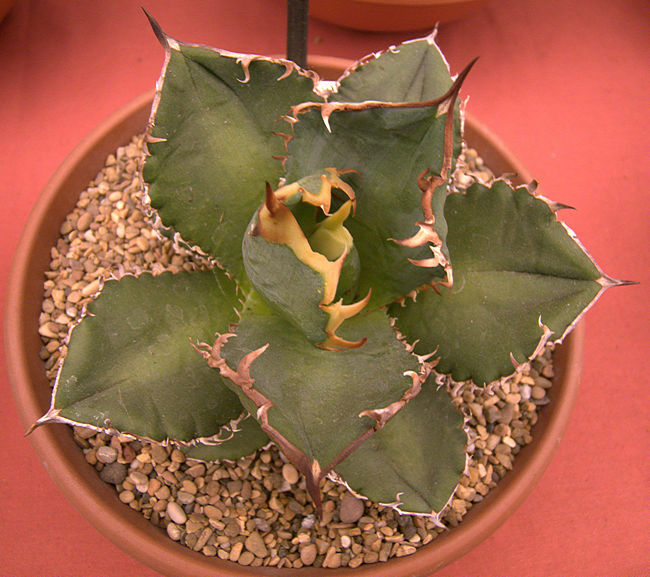 This selected form, which may be seen with a variety of labels and spellings, has strong variegation on the upper leaf surface contrasting nicely with the reddish-brown thorns. 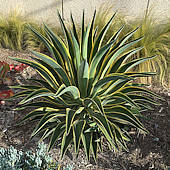 This Agave has a compact glaucous green rosette when young, tending to offset at the base, becoming more open with longer leaves when mature but growing as a solitary plant. The leaves have attractive dark green longitudinal markings, small brown marginal teeth and a stout brown terminal spine. Flowering is rare. This species may be a natural hybrid e.g. A. lechuguilla x A. victoriae-reginae. 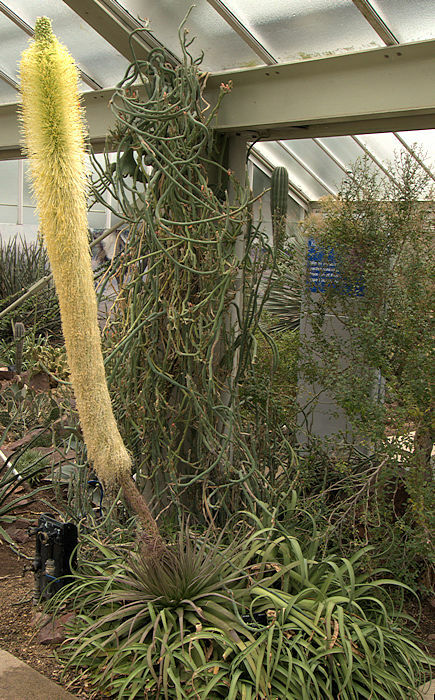 is a huge succulent plant, growing over 6 ft tall and 12 ft wide. The thick fleshy leaves are guttered. Their margin is undulate with large brown marginal teeth. The inflorescence is a substantial panicle of yellow flowers. 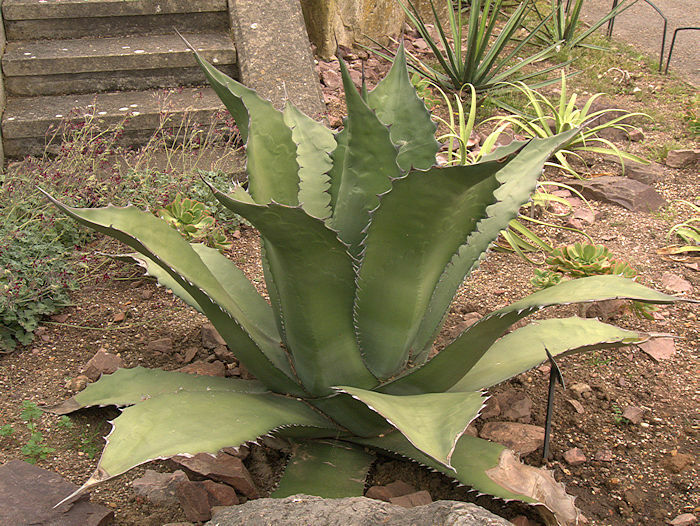 This plant is the species most comonly used to produce pulque in Mexico. It is used as an impressive ornamental in Mediterranean climates. Photographed in the Boyce Thomson Arboretum. Arizona. Specimens of this succulent plant growing outside at Royal Botanic Gardens, Kew are sufficiently hardy to survive the English winter. The leaves have impressive marginal teeth and terminal spines. flowering on a grassy hillside alongside the Ruby Road, Arizona. May 1997. The narrow leaves, with slightly filamentous edges, blend into the grassland making it hard to see except for the current and old inflorescences. The plant contains saponins (soapy substances) and was used to wash clothes. The small yellowish flowers on the short 4 - 5 ft inflorescence are noted for their fragrance. at the Desert Botanic Garden, Phoenix, Arizona September 2004. 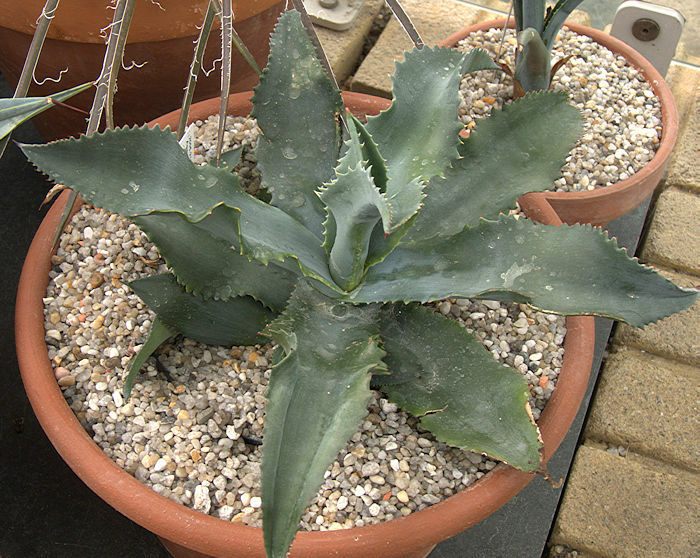 A collection of several varieties of Agave schottii is planted out here. A short 3 ft trunk that develops with age is crowned with a rosette of sword-shaped blue-grey leaves up to 6ft long and terminating in a sharp spine. Each leaf contains around a thousand long fibres which are extracted, cleaned and dried to make sisal. A plant may make up to 300 leaves over its life. The inflorescence is a 20ft stalk, branching towards its end, with each branch carrying clusters of unpleasant-smelling yellow flowers. The flowers are followed by bulbils but not seed. 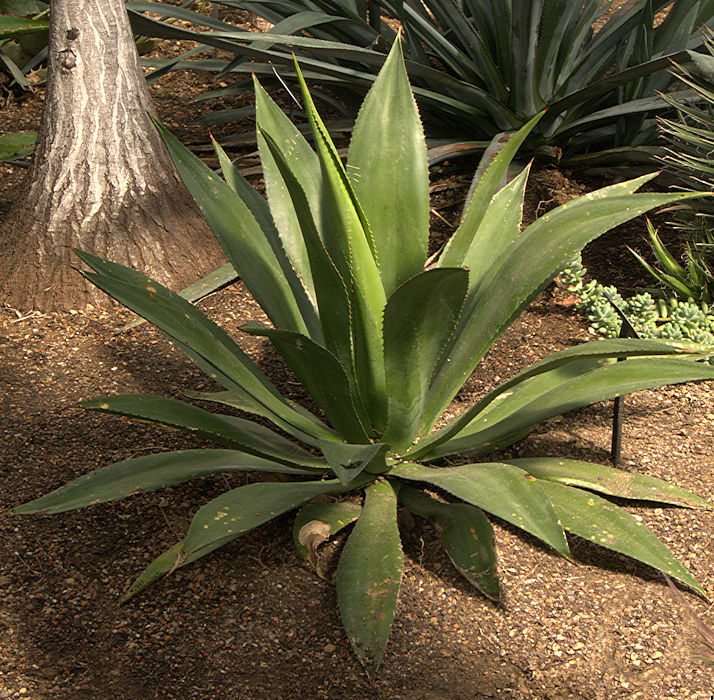 Copious production of bulbils predisposes this Agave to be invasive in some places. Native to Southern Mexico, possibly the Yucatán Peninsula, although as with many useful plants that have become widely-distributed, an exact place of origin is uncertain. This species may be a man-made hybrid. This distinctive plant has soft greyish leaves with soft ends and without a terminal spine or marginal teeth. 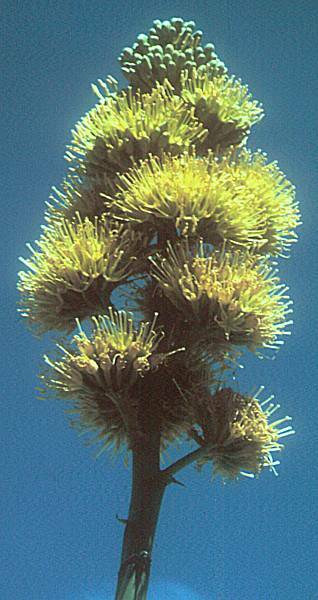 The inflorescence is a slender, arching spike of tubular greenish-yellow flowers with an unpleasant aroma. Native to the Mexican state of Hildago. 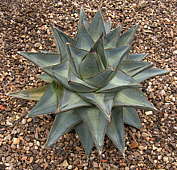 Agave stricta consists of a dense, rounded rosette of hundreds of somewhat curved, narrow leaves about a quarter of an inch wide and up to 20 in long. 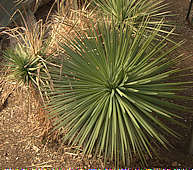 The leaves are angular with a curved top and bottom surface, no marginal teeth but a sharp brownish terminal spine. This succulent plant spreads both by offsetting and with long (6 ft) prostrate stems. 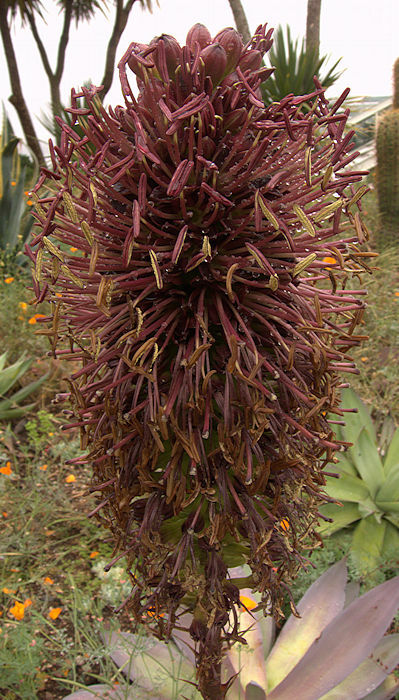 The inflorescence is an 8 ft spike of maroon flowers. This species is native to dry limestone hills in the state of Puebla, Mexico. Propagate by removing offsets. 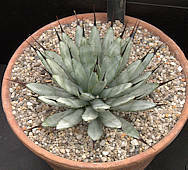 Agave stricta is the ultimate hardy Agave, even tolerating the miserable cold-wet Winter in South-Eastern England although the dense, symmetrical growth habit may be lost. As I have a heavy clay soil, my own plant is in a large planter with a gritty, free-draining compost, but several specimens grow outside and flower in the rock garden at Royal Botanic Gardens, Kew. 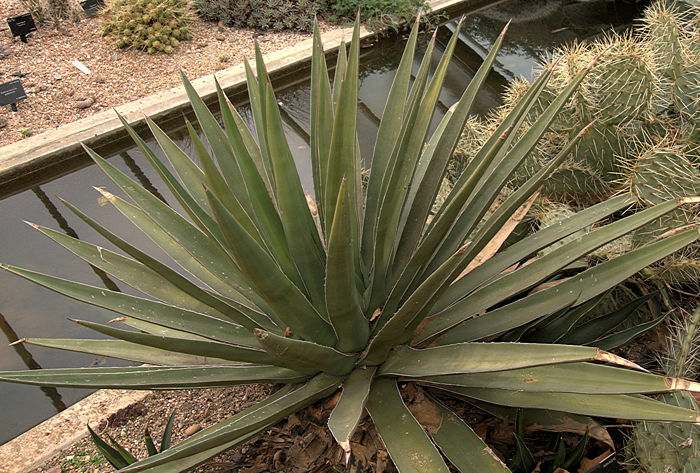 Left: Agave stricta var. pallida is a less robust cultivar than the parent. The pale green leaves are shorter, generally not exceeding 8 - 10 in long, but retain a sharp brown tip. This makes a fine specimen for a pot but is probably not hardy. 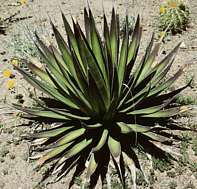 is perhaps the most important Agave for it is from the starchy heart of a mature Agave tequilana from which the emerging flower bud was removed that the alcoholic distillate Tequila is made. 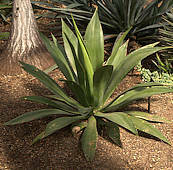 Tequila originates from the town of Tequila and its surrounding region in Mexico, where selected clones of Agave tequilana are grown commercially. 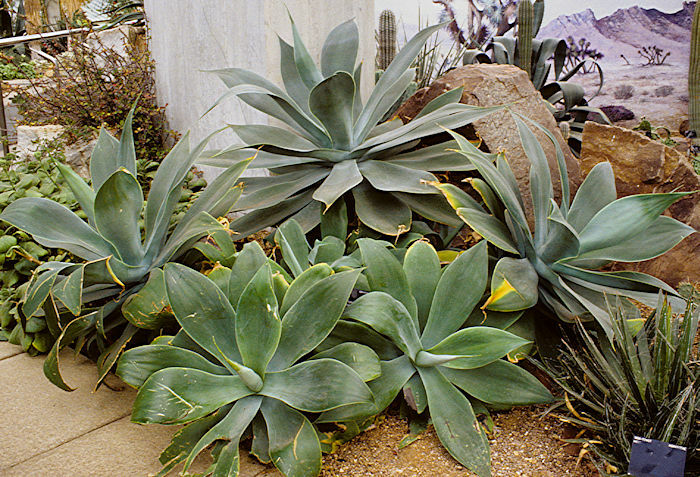 This species may be seen bedded out as a large specimen plant in warm climates. The bluish leaves have finely toothed margins. 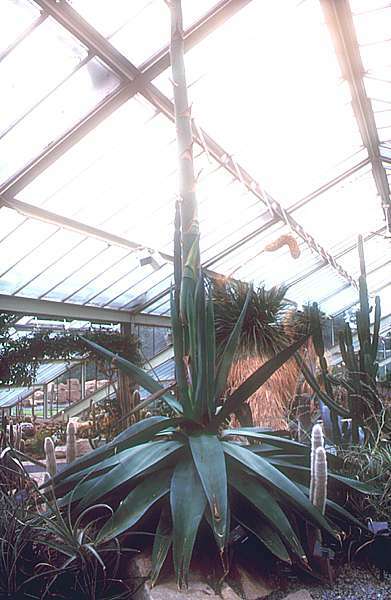 The inflorescence of this specimen was taller than the Princess of Wales Conservatory at RBG Kew. 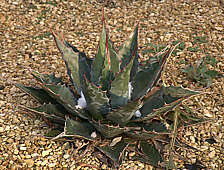 This is a medium-sized Agave whose solitary robust-looking rosettes are formed from a small number of broad blue-green leaves with a white farinose coating, stout curved marginal thorns and wicked terminal spines. Forms with all-green leaves occur naturally. The inflorescence is a 10 ft dense spike of yellow flowers. Known from a single limestone canyon at an elevation of over 3000 ft in the Mexican state of Oaxaca. at the Desert Botanic Garden, Phoenix, Arizona. 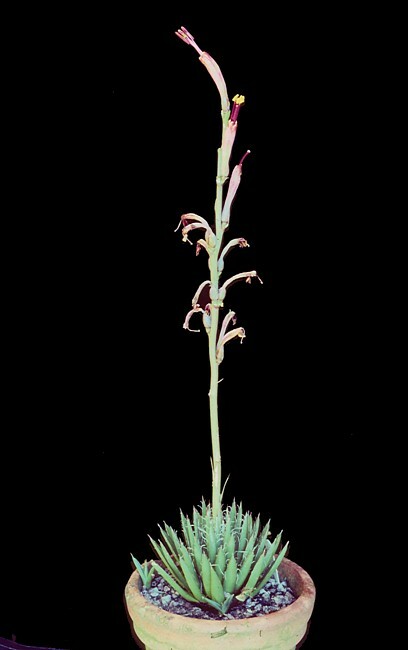 This species grows up to 1 ft tall in dense clumps at elevations of up to 4500ft in central Arizona. The leaf margins are smooth or with tiny teeth and markedly filmentous. 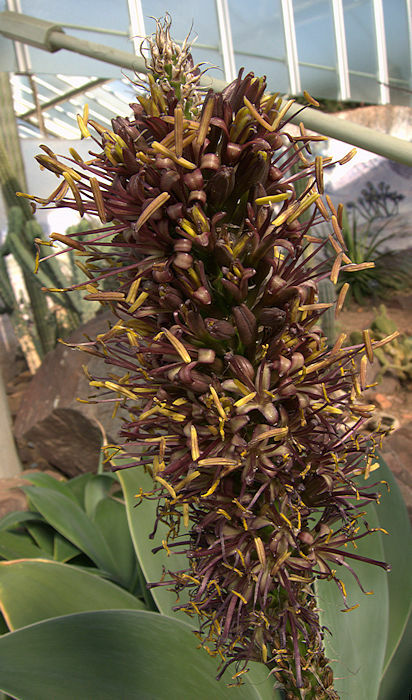 The inflorescence is up to 8 ft tall with greenish-yellow flowers. 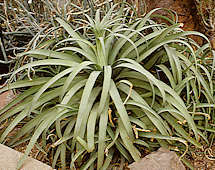 is a selected cultivar of A. toumeyana with brown leaf margins, decorative white leaf markings and particularly curly leaf filaments. Best grown as a single rosette to show off the markings. Photographed at the Boyce Thompson Arboretum, Arizona. 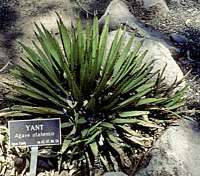 forms large clumps, with individual rosettes having large numbers of stout bright green leaves up to a foot long and marked with bud imprints. Leaf margins carry small widely spaced grey teeth with a characteristic basal ring. Leaf tips have grey spines with a groove on their upper surface. The inflorescence is up to 8 ft tall and variable in form, but generally a panicle of light yellow flowers. 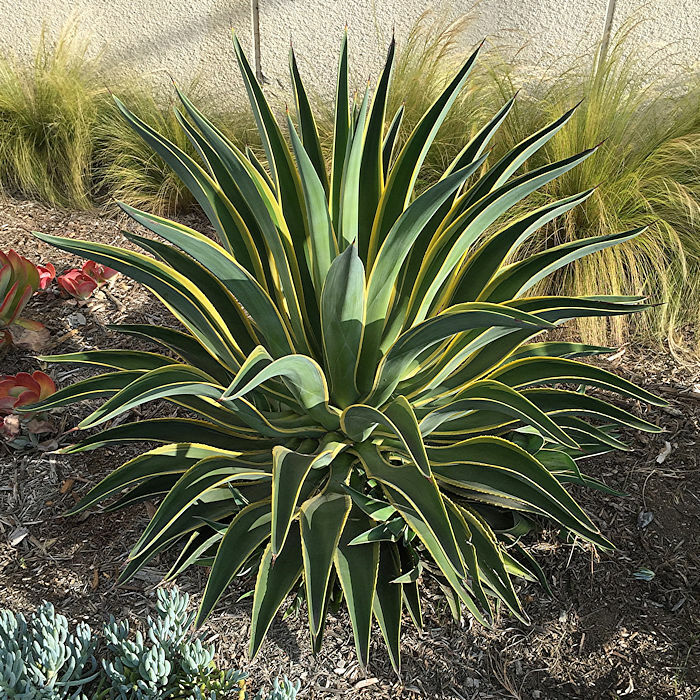 Growing further North in Arizona, California, Nevada and Utah than other Agaves, this plant is extremely cold tolerant, but only if kept absolutely dry when cold. It has been used as a source of fibre for cordage. named for Queen Victoria of England, forms a distinctive rosette of stiff thick leaves with distinct "keels" and longitudinal white markings. 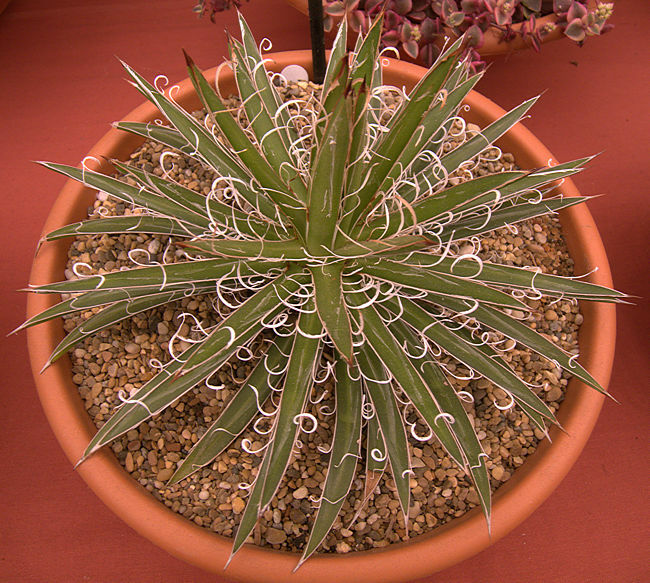 Rosettes may be a little over 2 ft in diameter and are usually solitary or offsetting sparingly. The inflorescence is a 10 ft spike of white flowers with a reddish tinge. 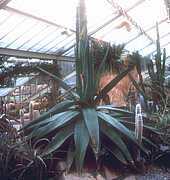 This plant is prized by collectors, although it is not easy to grow a large unmarked specimen. Several cultivars have been named with different patterns of white leaf markings or no white markings (var. viridis) or variegation. This species is native to limestone soils of the Sierra Madre Oriental Mountains of North-Eastern Mexico where it is rare. Worth adding a handful of ground dolomite of lime to its potting mixture. 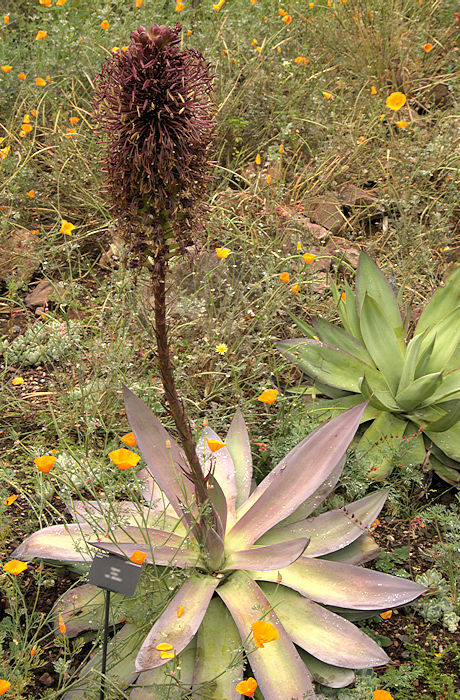 Photographed at the Boyce Thompson Arboretum, Arizona and in flower at Royal Botanic Gardens, Kew. is a large solitary plant up to 5 ft in diameter. The light bluish-green leaves with smooth brown margins have swollen bases and taper to a fine, sharp but flexible terminal spine. The plant produces a 15 ft dense raceme of yellow flowers and numerous bulbils. 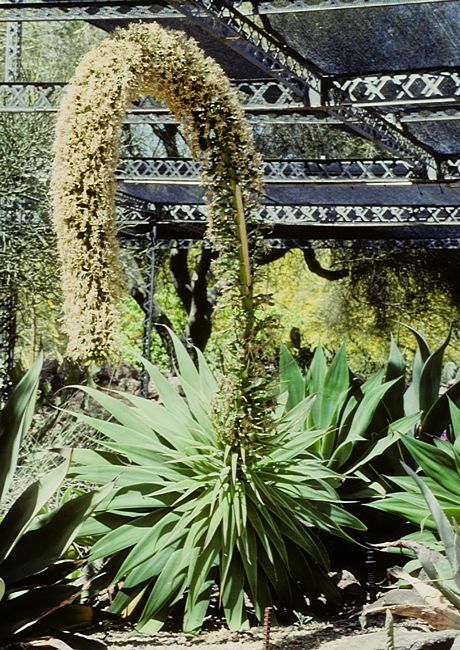 Agave vilmoriniana is native to Northern Mexico, growing between 2000 and 5500 ft, typically growing on the face of cliffs and steep canyons. It is not hardy to more than slight freezing temperatures, but a splendid ornamental plant for Mediterranean climates. The common name "Amole" indicates its use as a source of the soapy saponin (smilagenin) for washing clothes. Photographed at the Boyce Thompson Arboretum, Arizona, May 2006. 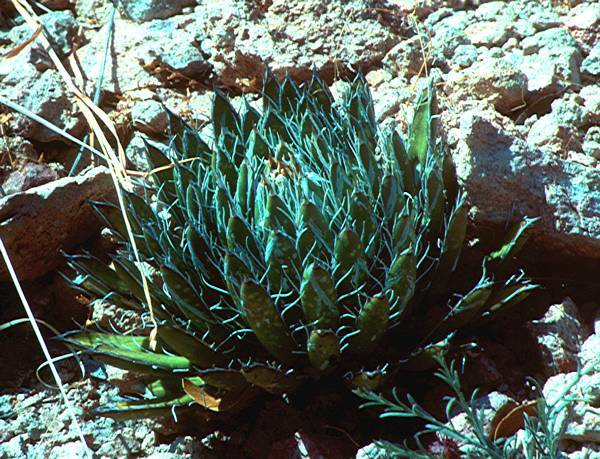 The rosette is formed from glaucous green lanceolate leaves with reddish brown margins funished with tiny teeth and a reddish-brown terminal spine. 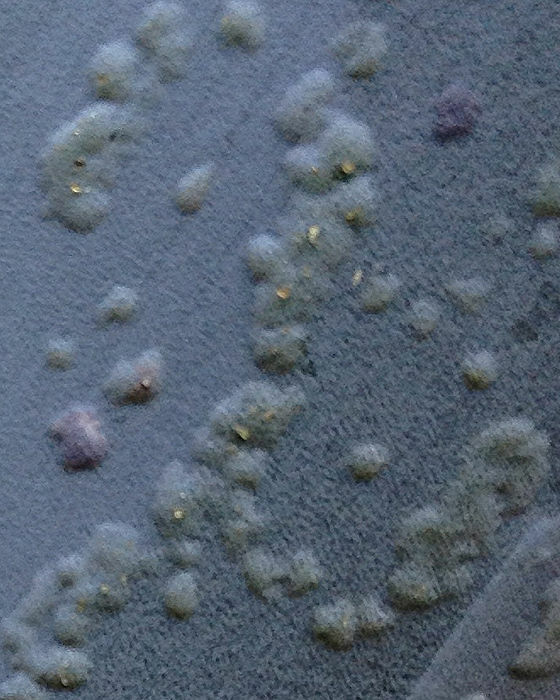 The leaf surfaces have fine horizontal banding. Native to the Mexican states of Jalisco and Veracruz. inflorescence reaching skywards at the Boyce Thompson Arboretum, Arizona, May 2006. This large species up to 5 ft tall and 10 ft across has slightly concave, flexible grey-green leaves with fine teeth along their margins to a greater or lesser extent. The terminal spine can be well over an inch long. 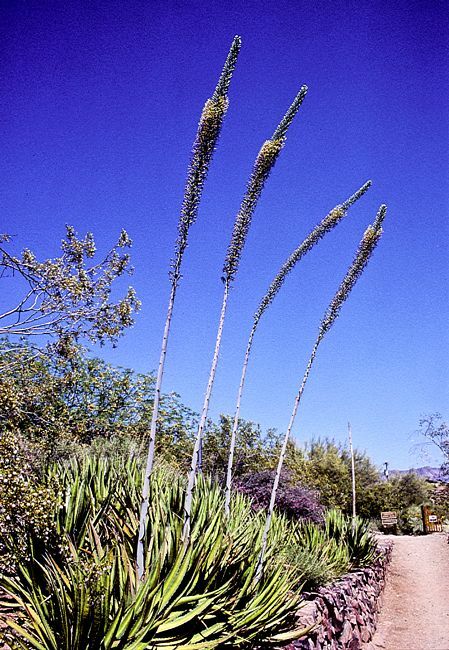 The flower spike is a panicle up to 26 ft tall, bearing bright yellow flowers and may produce bulbils as well as seed. Offsets are produced freely. 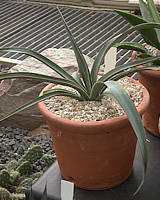 Agave weberi is apparently only known from cultivated forms in Mexico and SW USA. 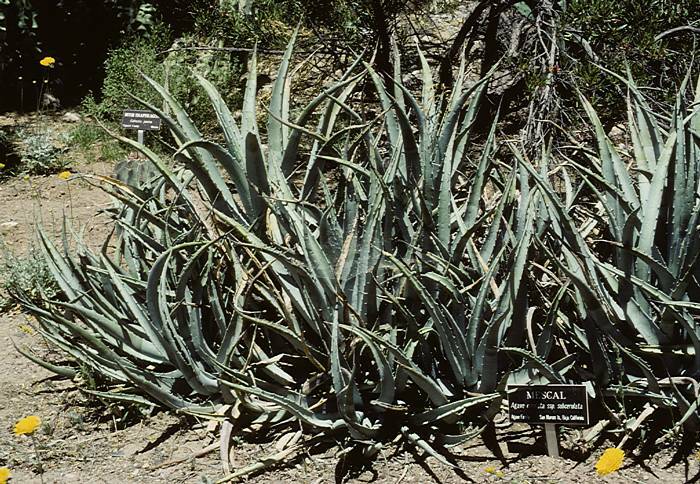 It is sometimes used as a source of fibre or pulque. 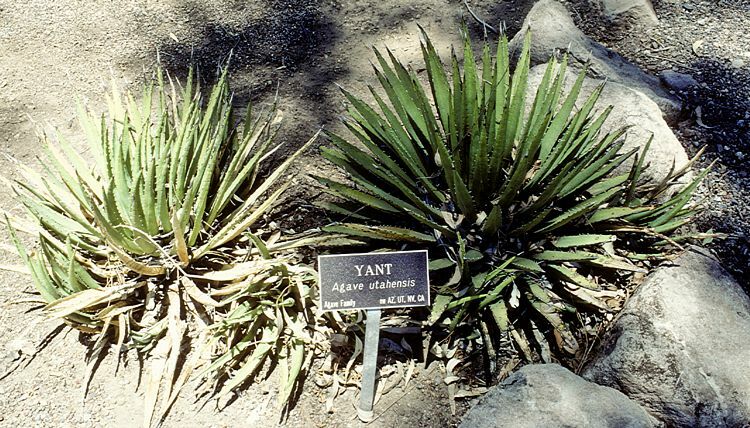 Although a low-desert plant it is frost hardy and can suffer from excessive heat. 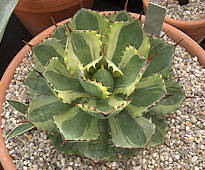 This uncommon succulent plant forms an open rosette up to 6 ft in diameter from green to glaucous-green leaves with fierce reddish-brown marginal spination and terminal spine. The leaves are thick and quite stiff and are marked with bud imprints. The rosette does not offset so must be reproduced by seed. The 15 ft inflorescene carries clusters of yellowish green flowers on side branches. Native to the Mexican states of Sonora, Chihuahua and Southern Durango, and Northern America. 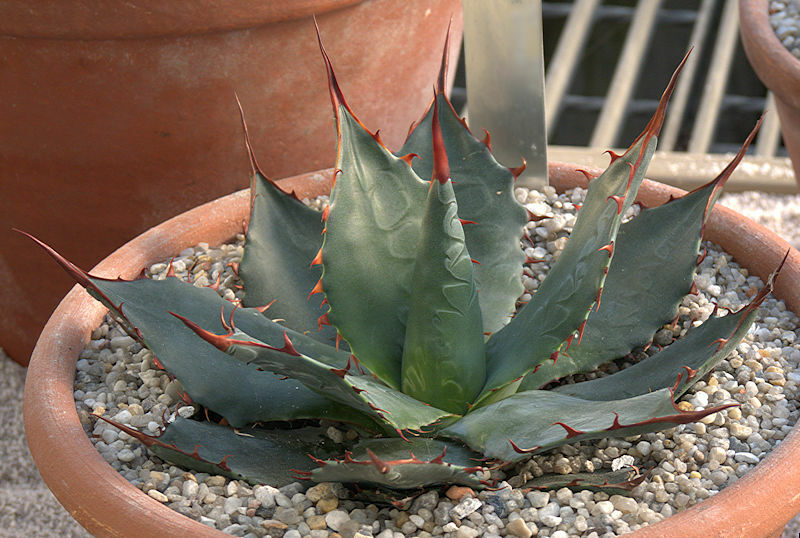 Agave wocomahi is a striking ornamental plant for a Mediterranean climate. This Agave is sweet and used by indians for eating and making mescal. The flowers can also be eaten. Above: Leaf footed bugs sucking sap from A. parryi in the Guadalupe Mountains, NM. Rabbits and other rodents may eat fleshy leaves or into the starchy core of a plant. These pests can be excluded by wire mesh fencing, which should be partially buried in the ground to discourage burrowing. The main pest is Agave Snout Weevil Scyphophorus acupunctatus, a glossy black beetle-like insect with a pointed snout, typically seen in late Spring and early Summer. The adult insects feed on sap from the leaves and may introduce harmful bacteria. However, the real damage is done by their larvae which infest the starchy core and roots of a mature plant leading to wilting leaves and collapse of the plant. The female weevil lays eggs on the base of lower leaves of a plant that is ready to bloom. 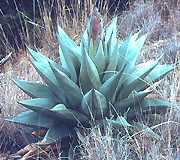 The consequences for an Agave monoculture, such as for the production of Tequila, can be devastating. 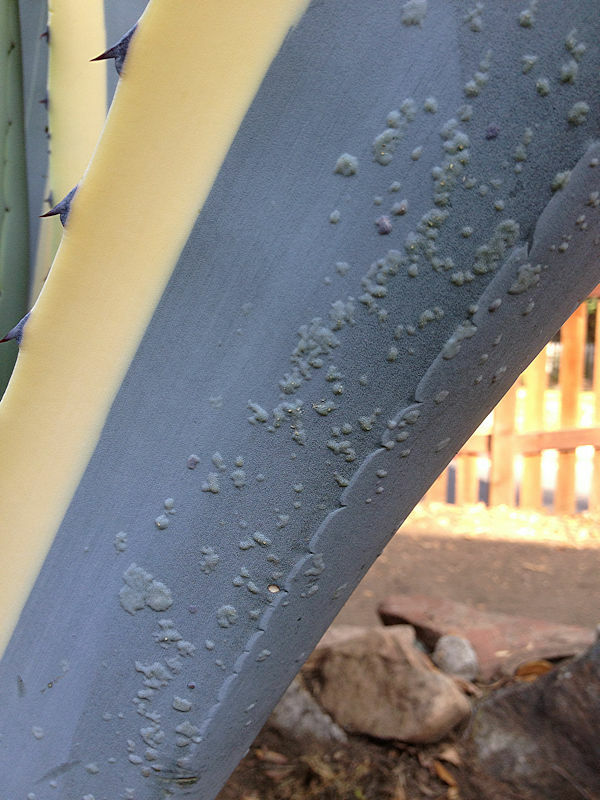 It is unlikely that this particular species of weevil will occur outside the native range of Agaves, but other types of bugs can sometimes be seen feeding on leaves (left). 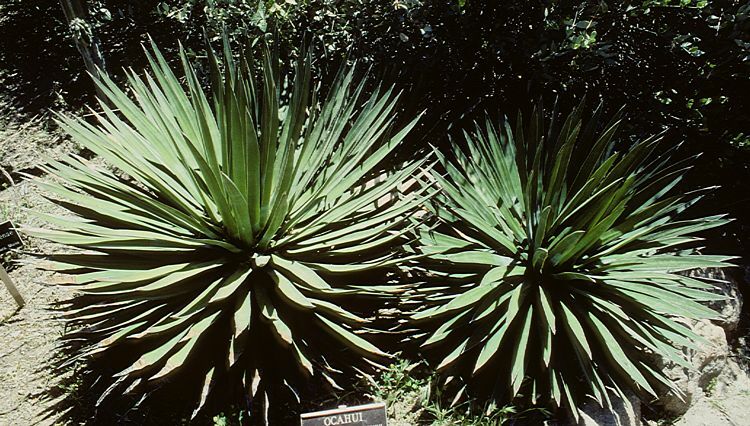 Although Agave Snout Weevil prefer the broader-leaved Agaves, any genera within the Agavaceae e.g. 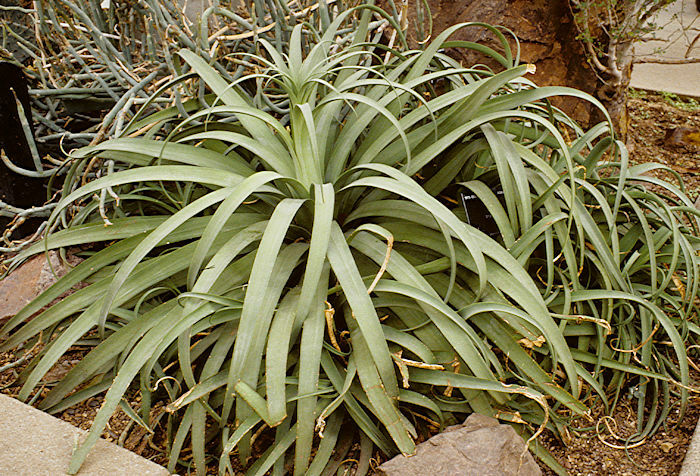 Beschorneria are at risk. Any snout weevils seen around a plant should be killed and a systemic insecticide applied. 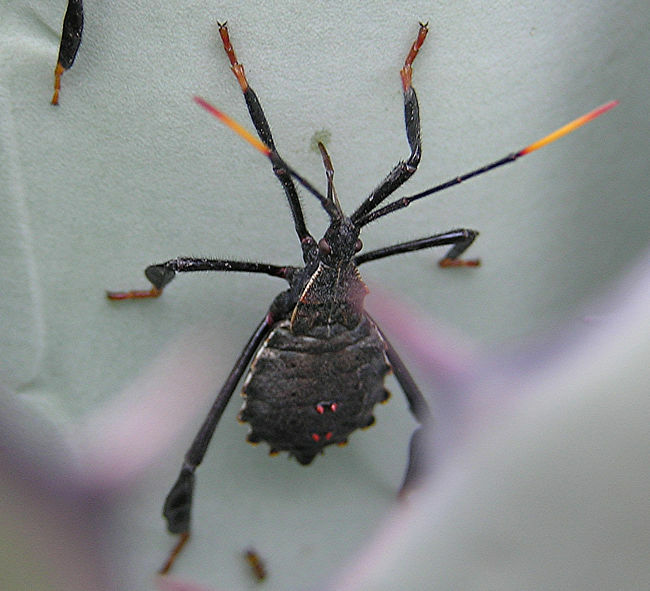 Prophylactic treatment with a systemic insecticide of an Agave collection within the native range of the weevil, may be advisable. Obviously this is impractical if any part of the plant is to be consumed or fermented. Once a plant has collapsed, it is too late for treatment. The infected plant should be removed and burned, along with any grubs that can be found. Watering nearby plants with a systemic inecticide may help to control the pest. 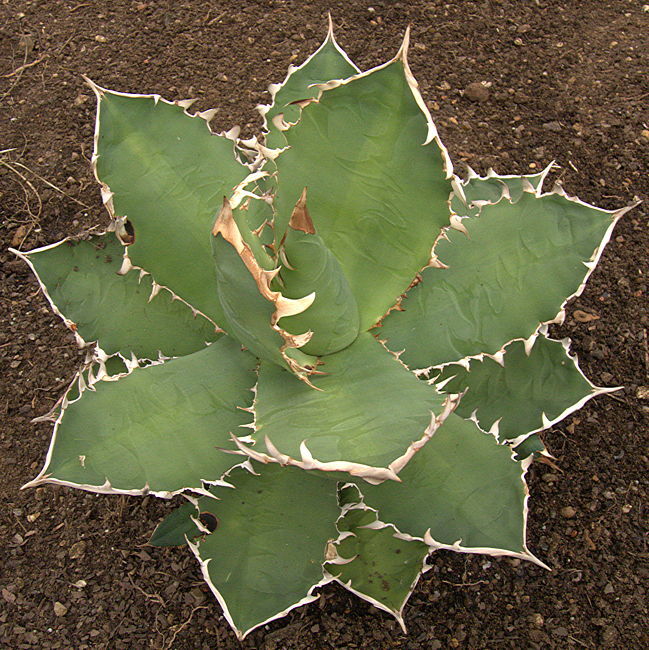 Agave edema (oedema) is a physiological condition, so not contagious. It is caused by watering during the heat of the day when the stomata are closed or by watering on a warm, dry day just before a change in the weather causes cool, humid conditions. The leaf takes up water faster than it can be dissipated by transpiration through the stomata and the epidermis separates from the underlying tissues and balloons out under pressure. Later on the damaged areas will collapse and leave unsightly brown or white scars. 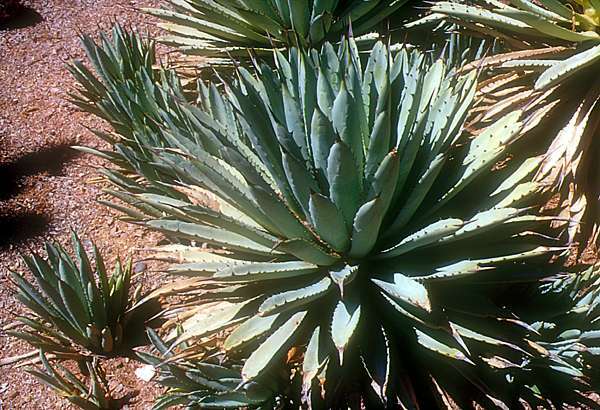 To avoid Agave edema, water during early morning or evening when it is cooler.